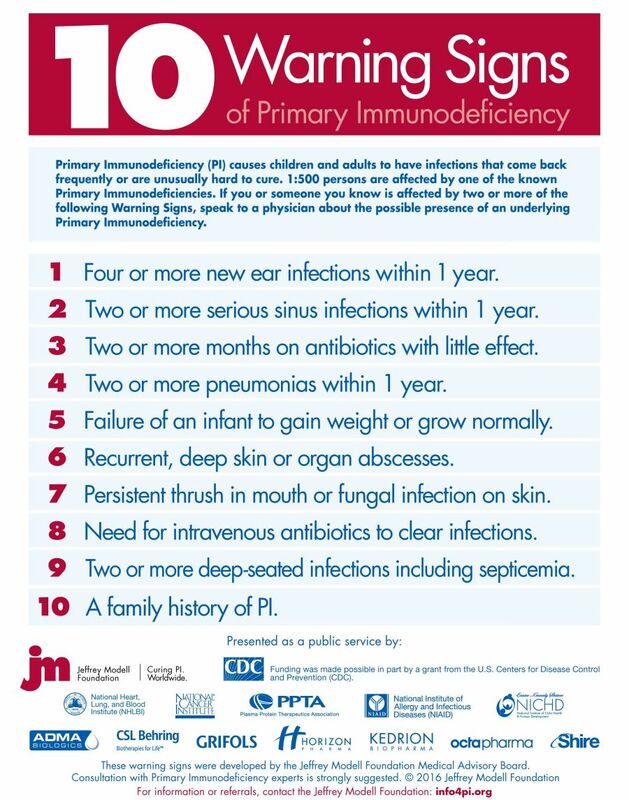 The Jeffrey Modell Foundation has created the 10 Warning Signs of PI to continue its mission to assure earliest possible diagnosis. 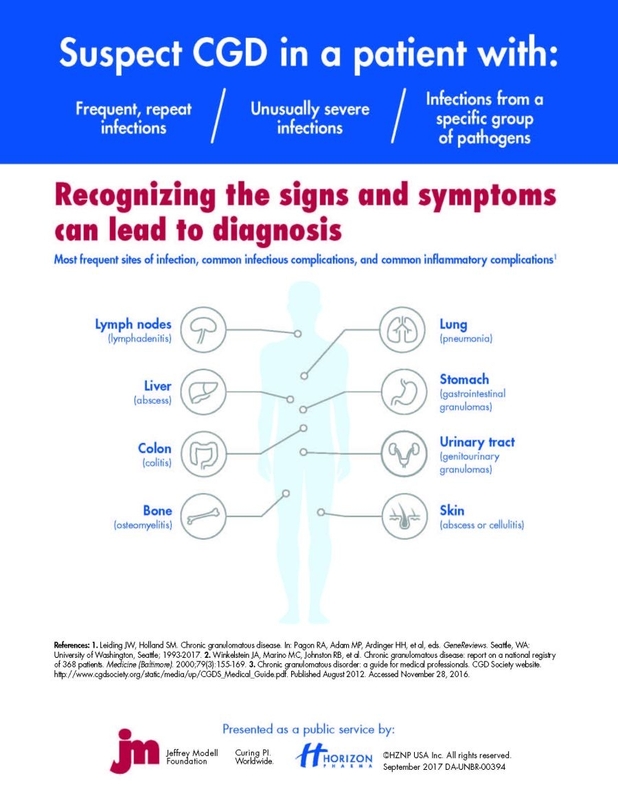 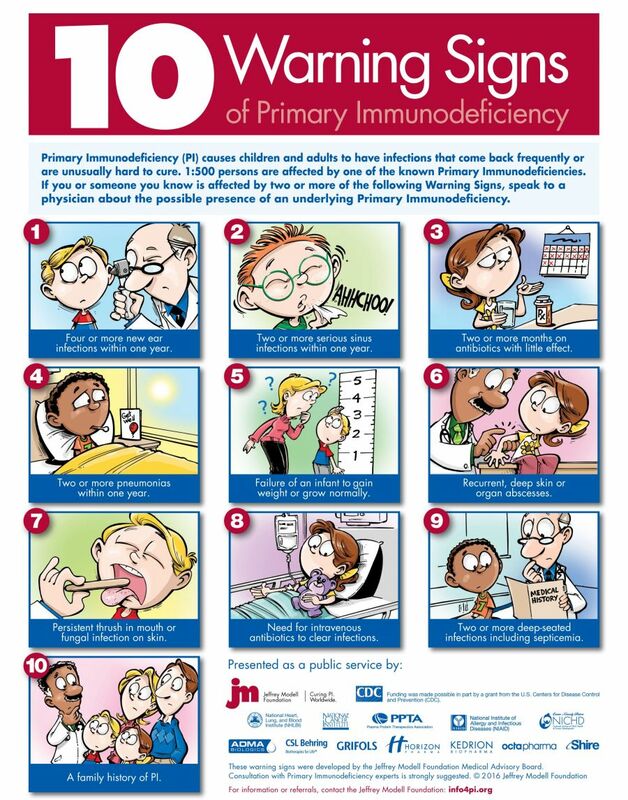 If you or someone you know is affected by two or more of the following Warning Signs, speak to a physician about the possible presence of an underlying Primary Immunodeficiency. 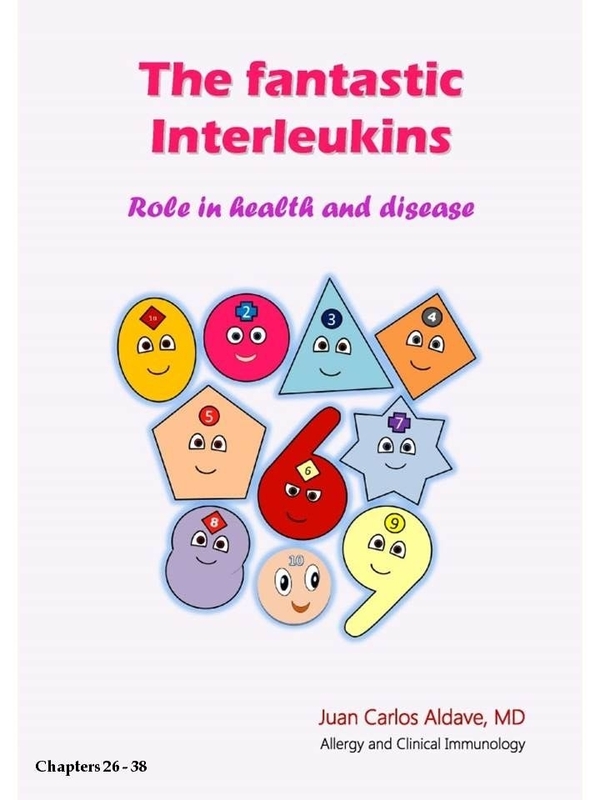 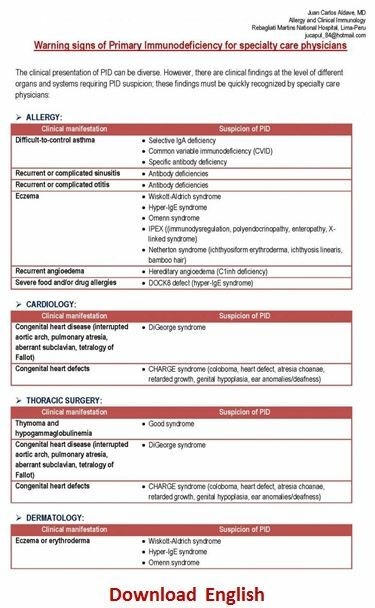 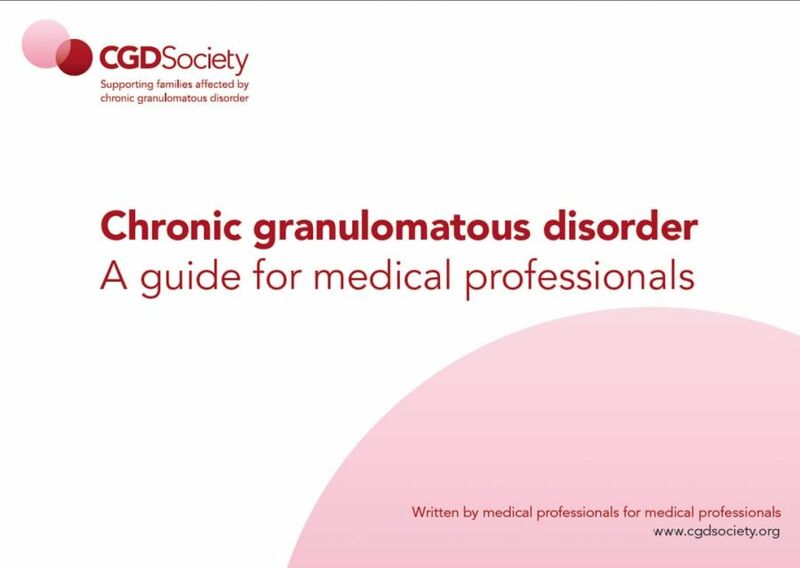 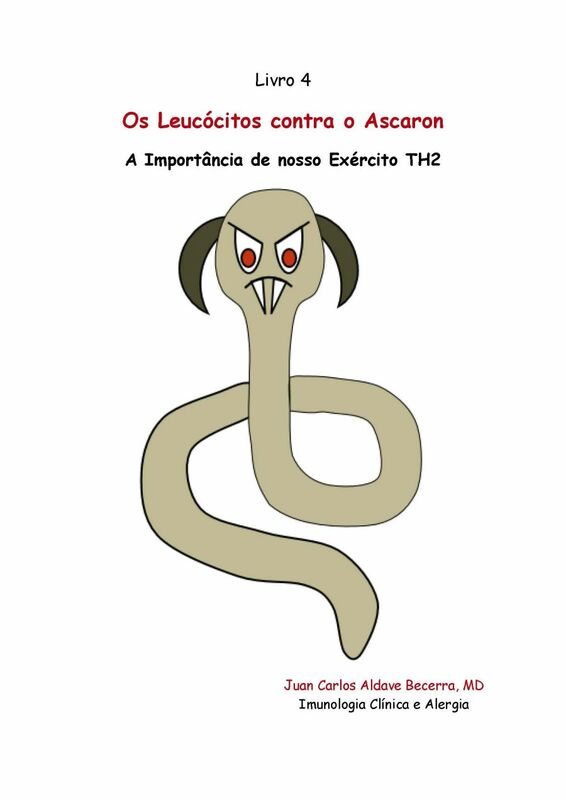 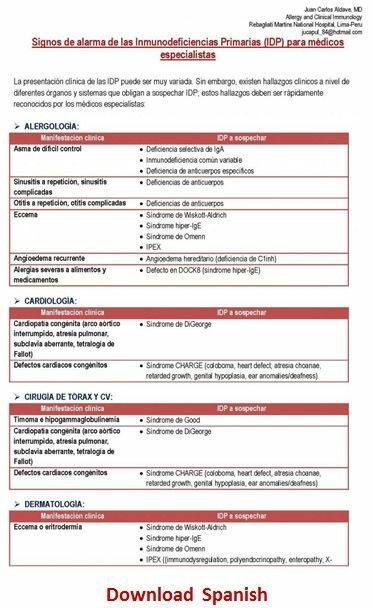 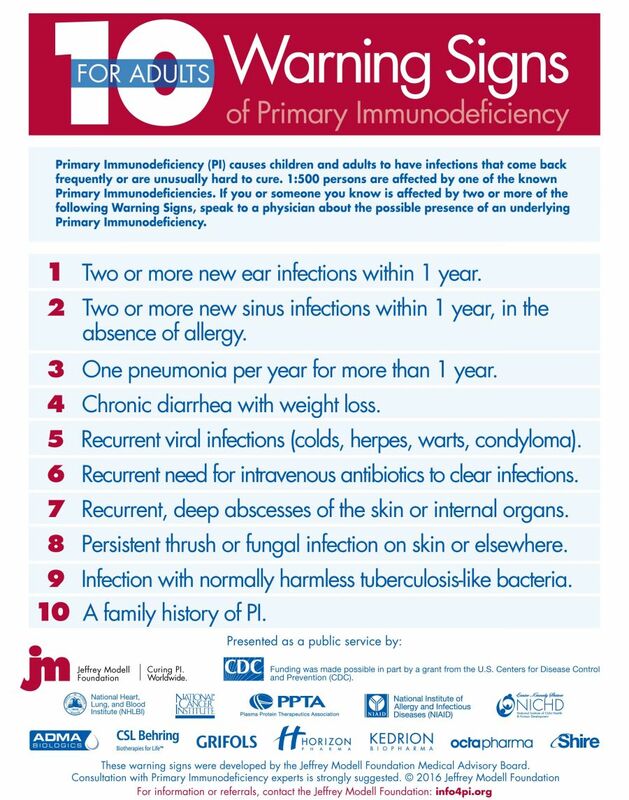 To assist physicians in making a PI diagnosis. 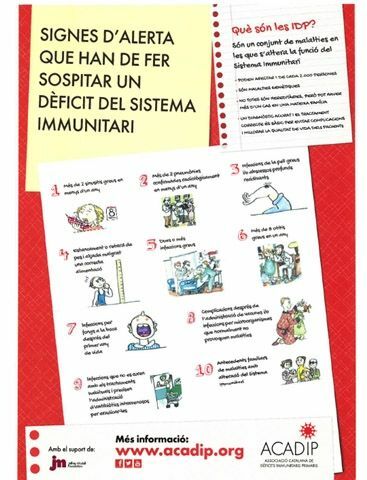 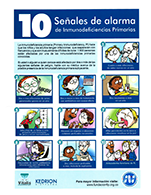 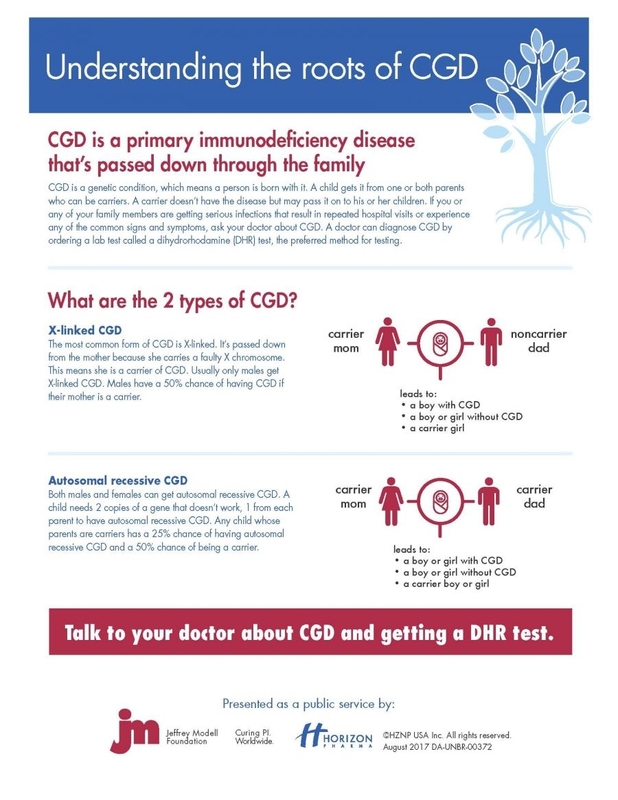 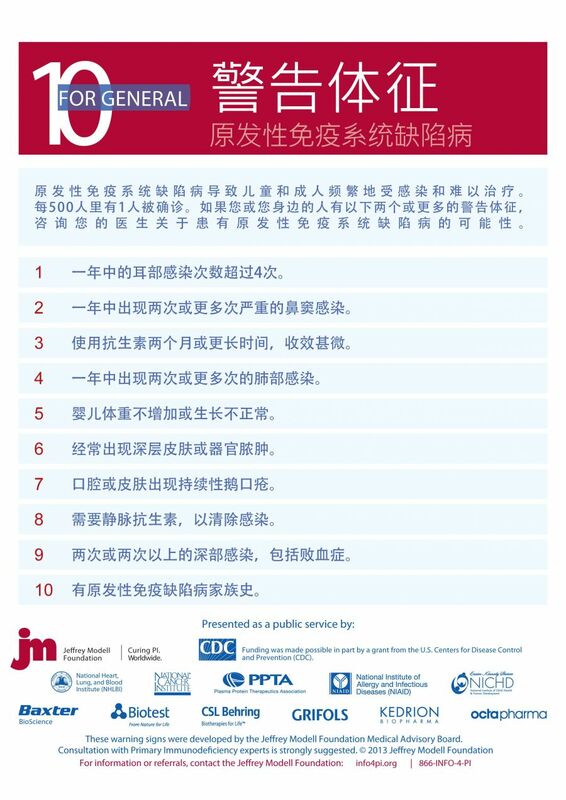 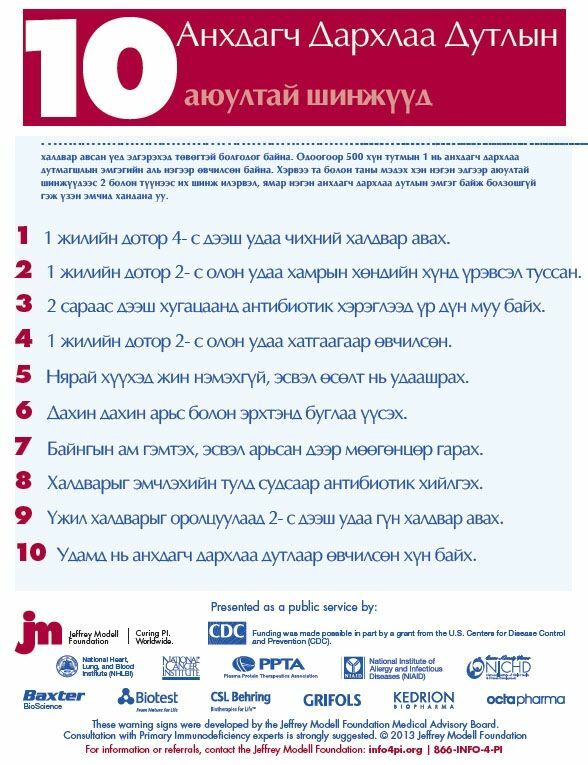 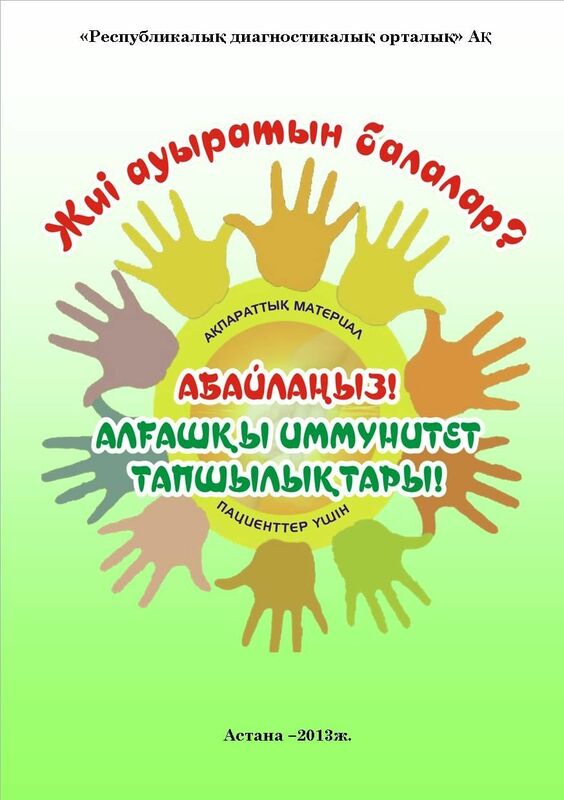 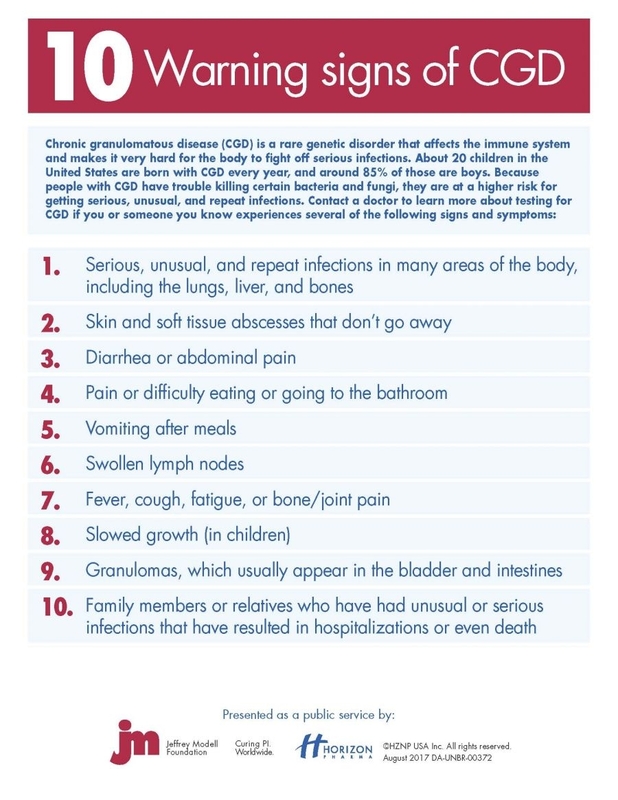 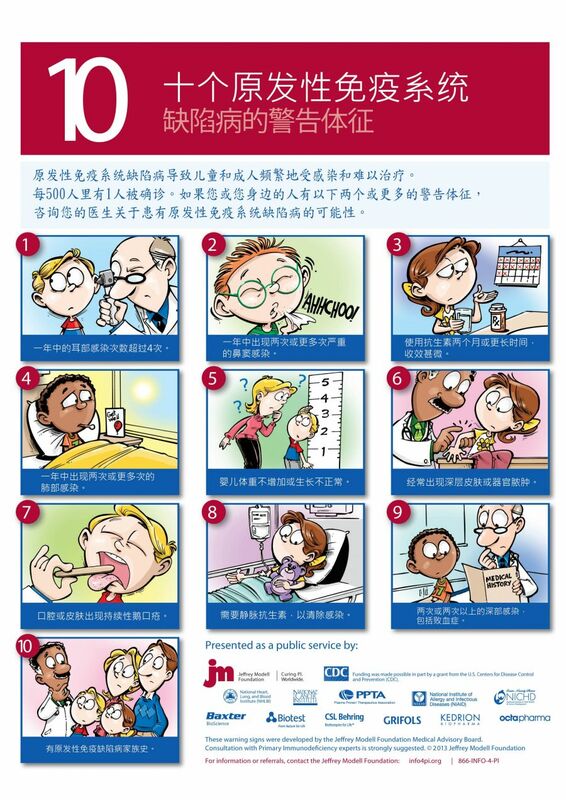 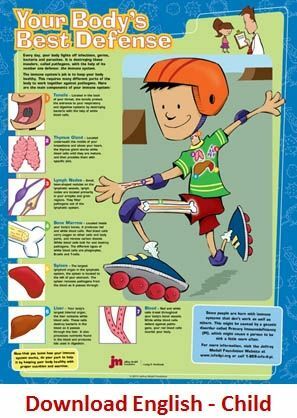 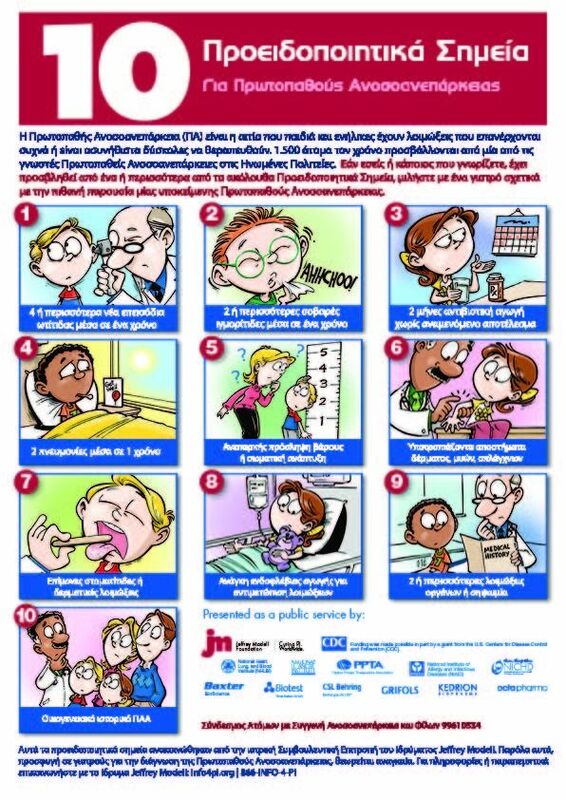 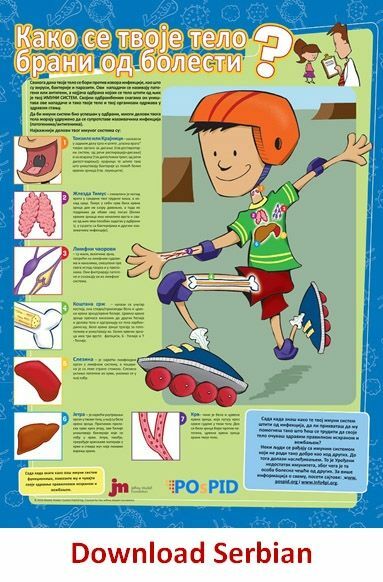 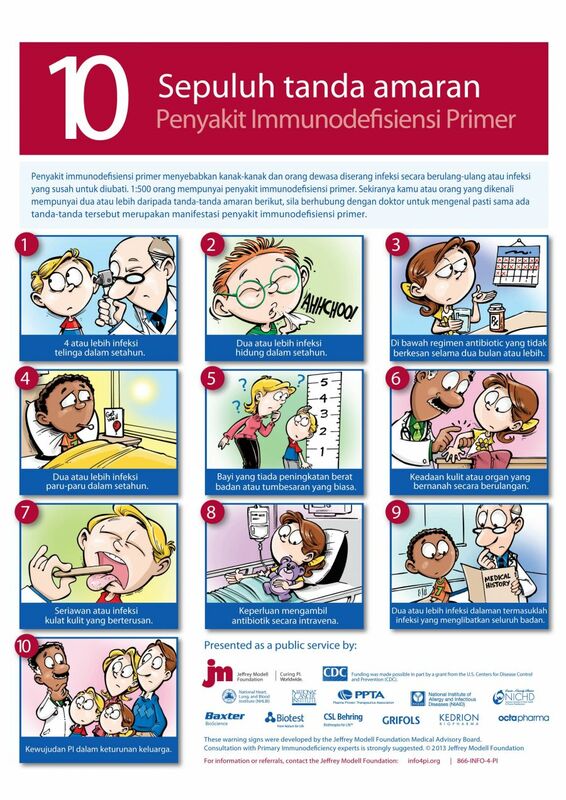 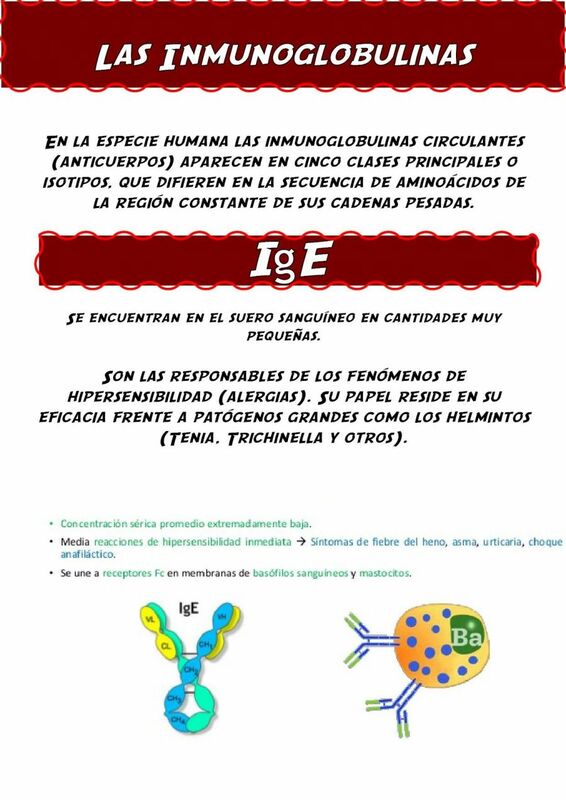 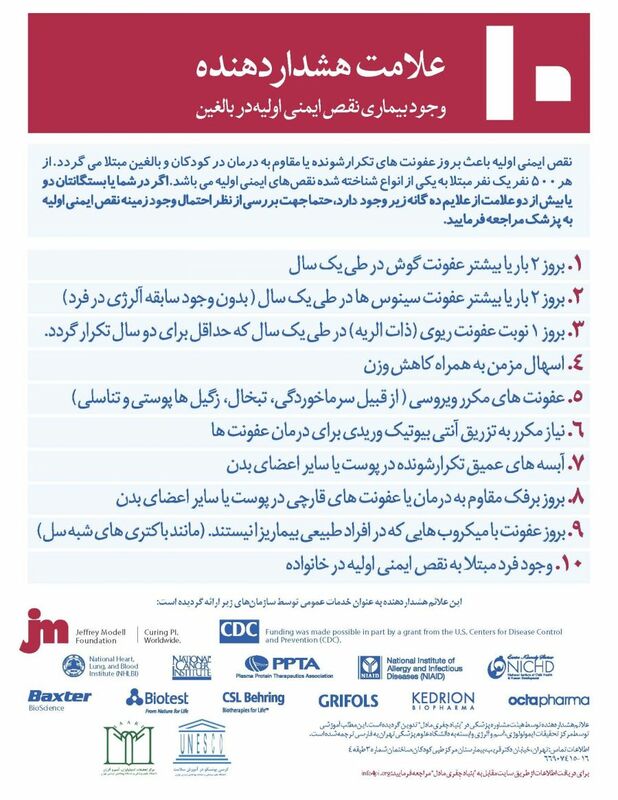 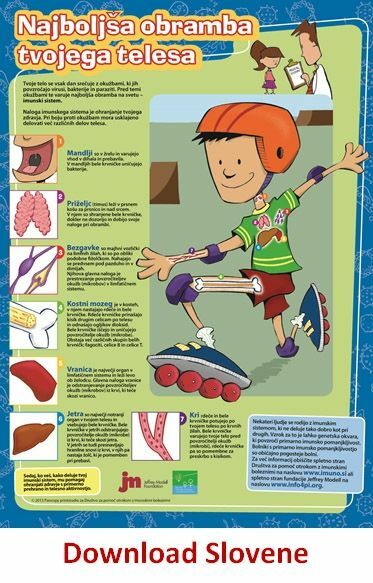 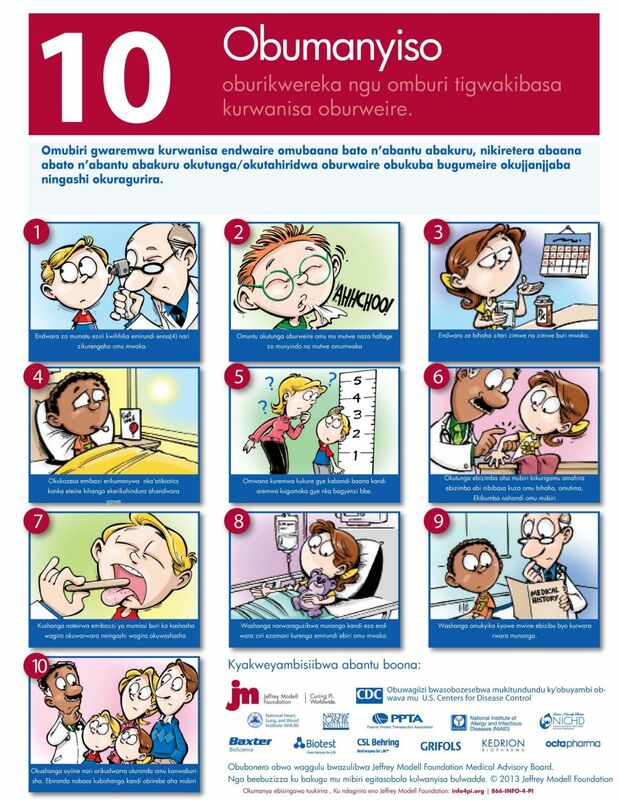 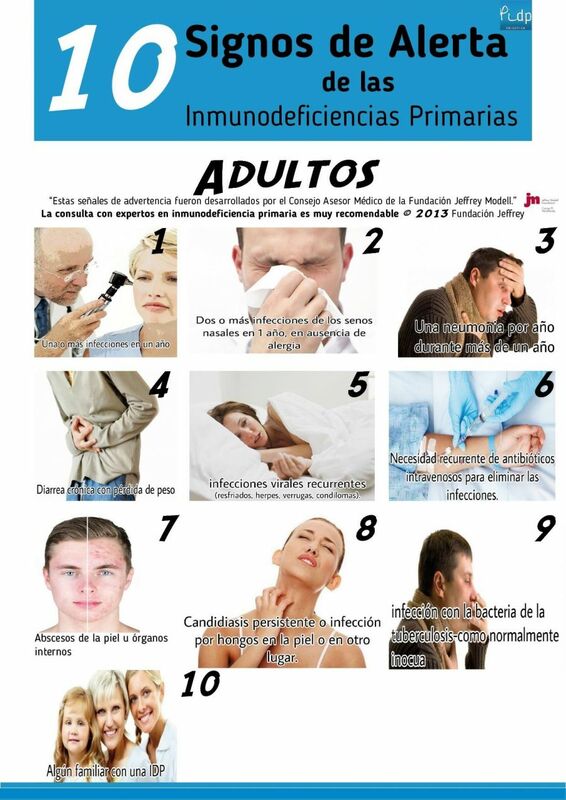 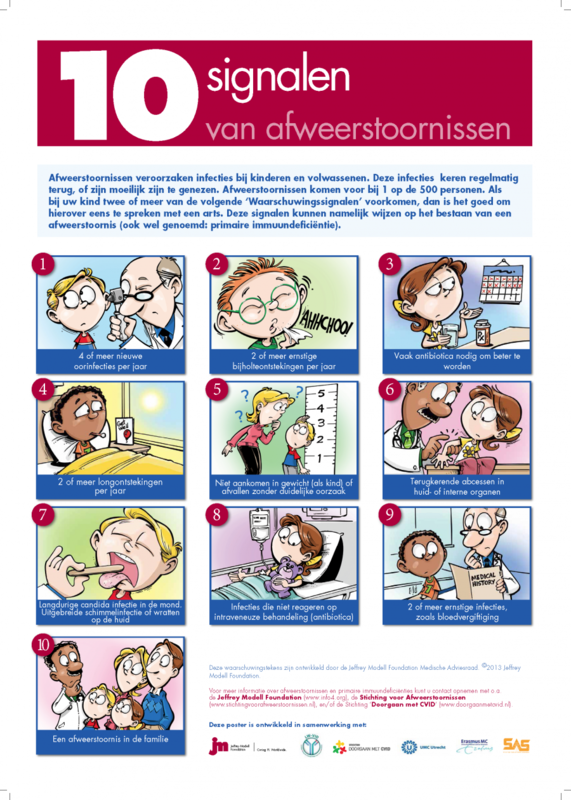 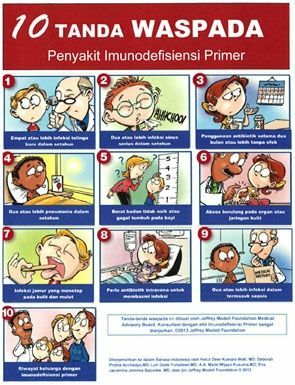 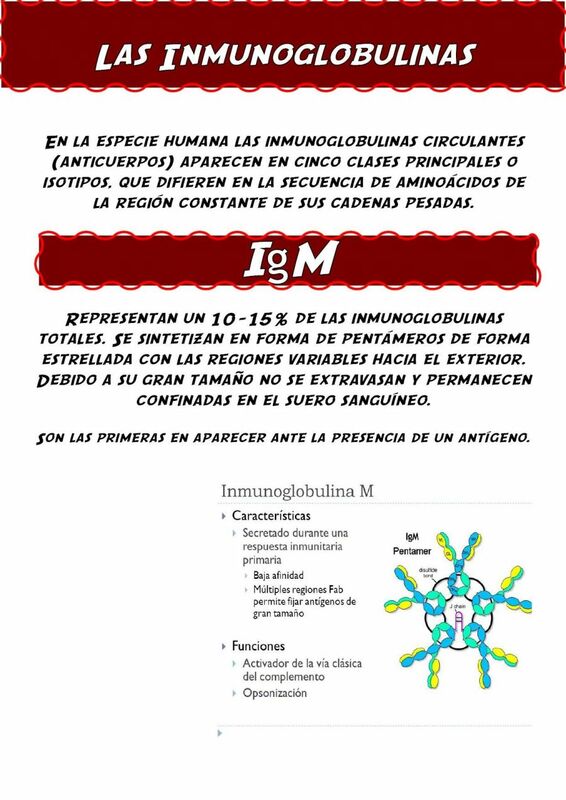 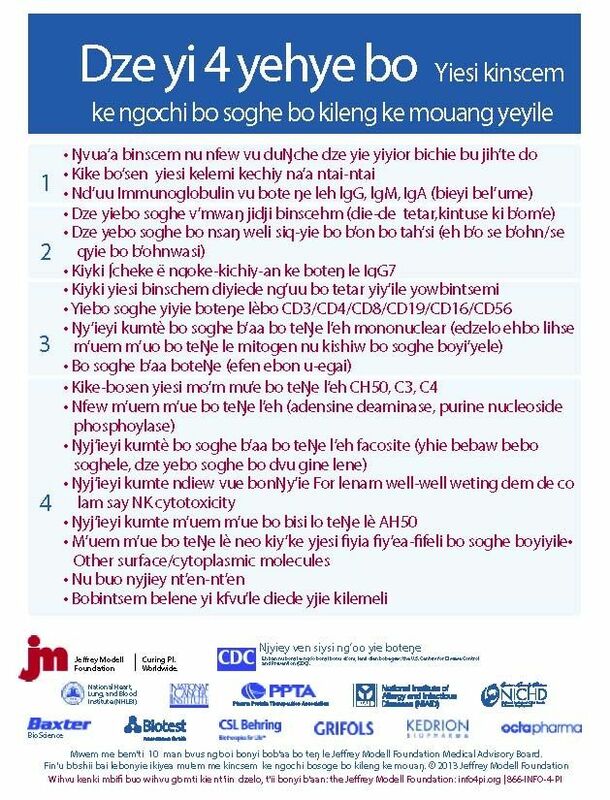 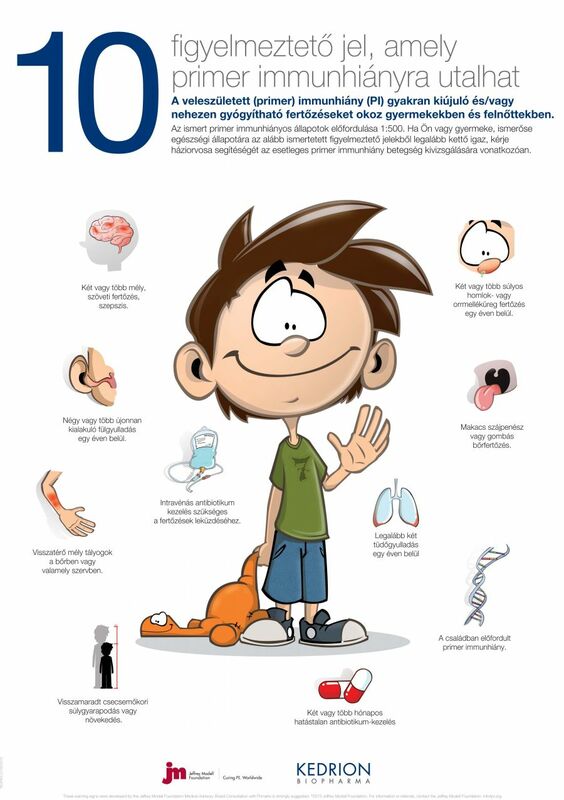 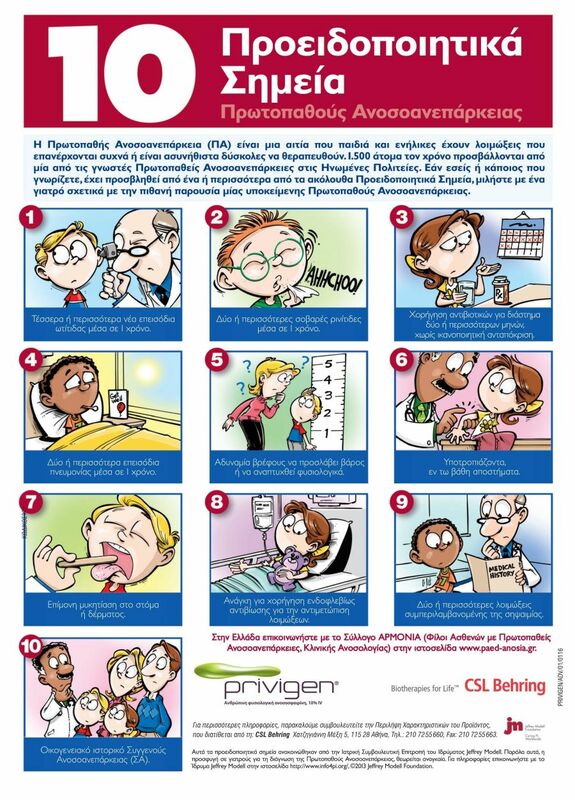 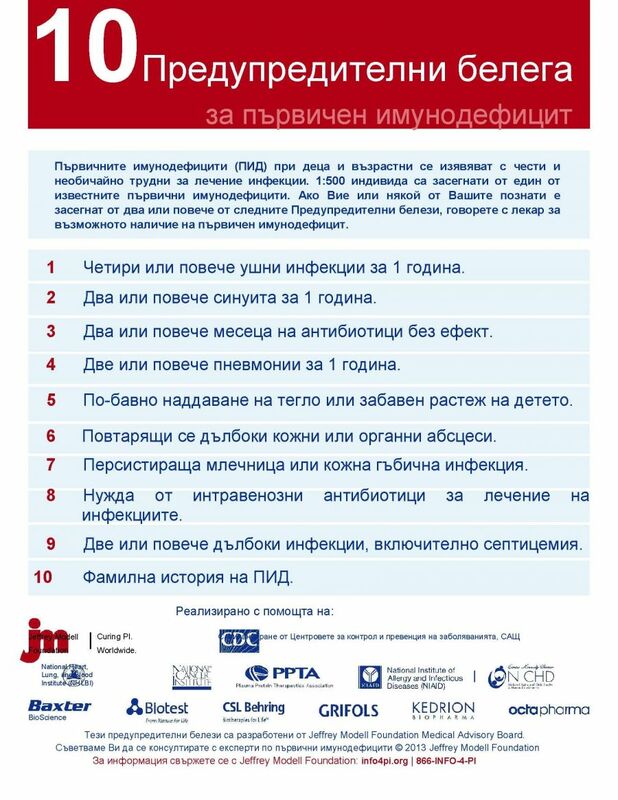 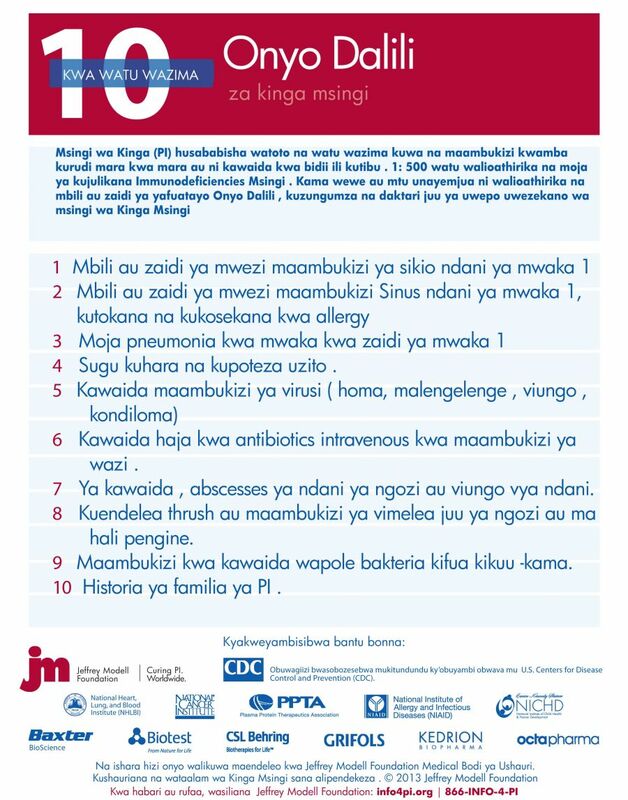 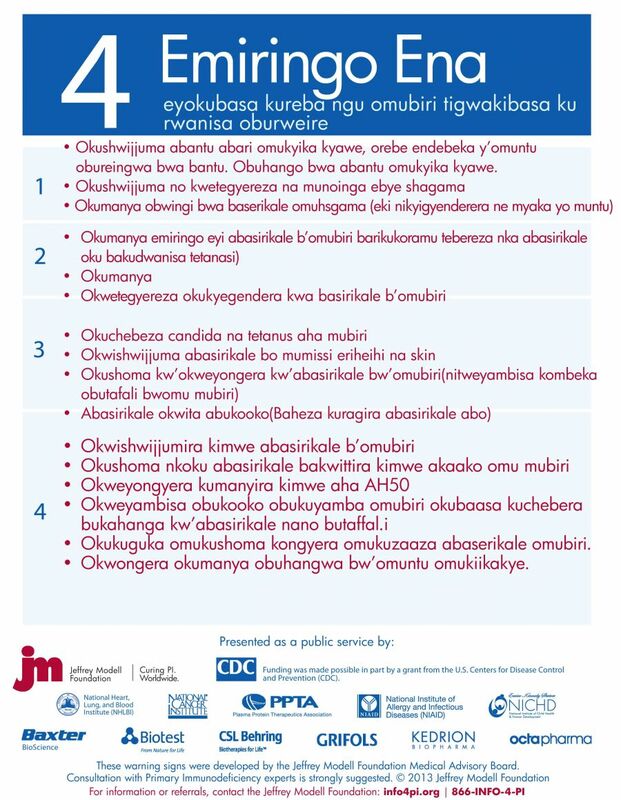 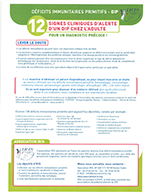 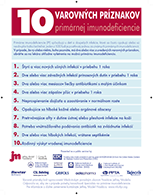 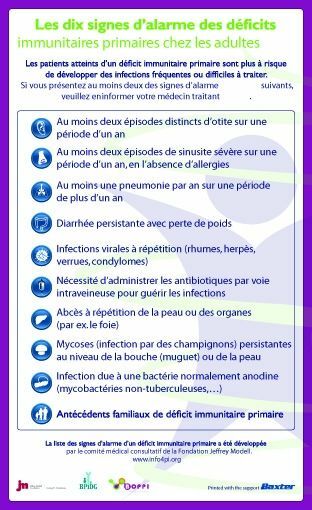 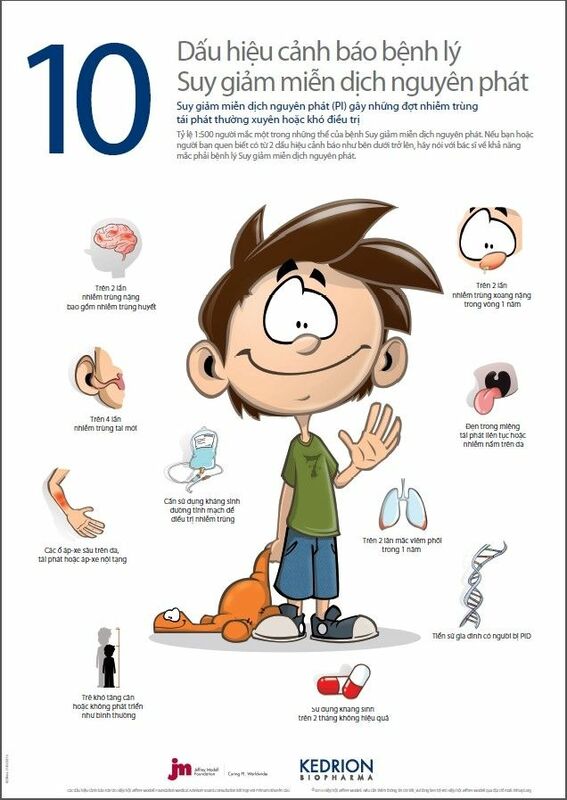 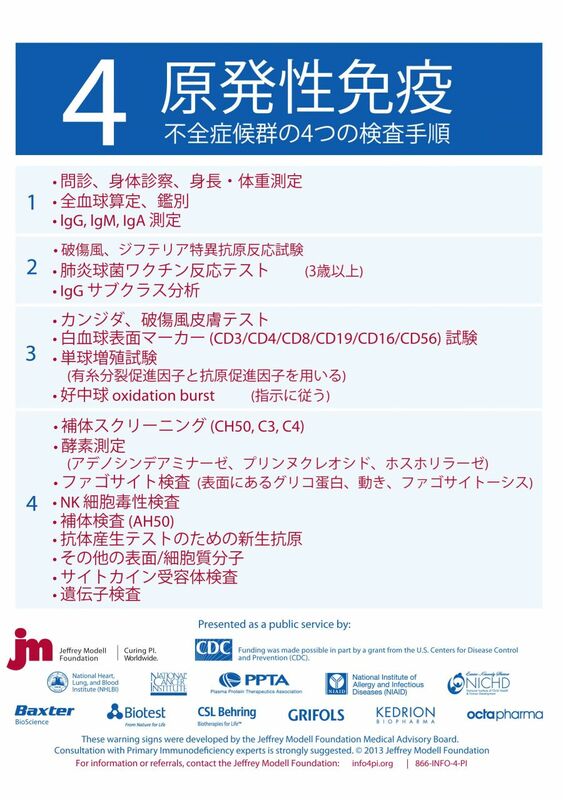 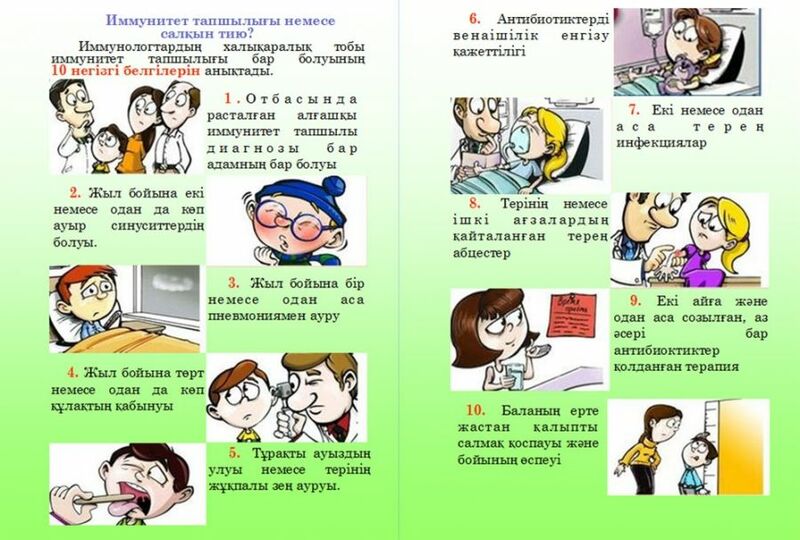 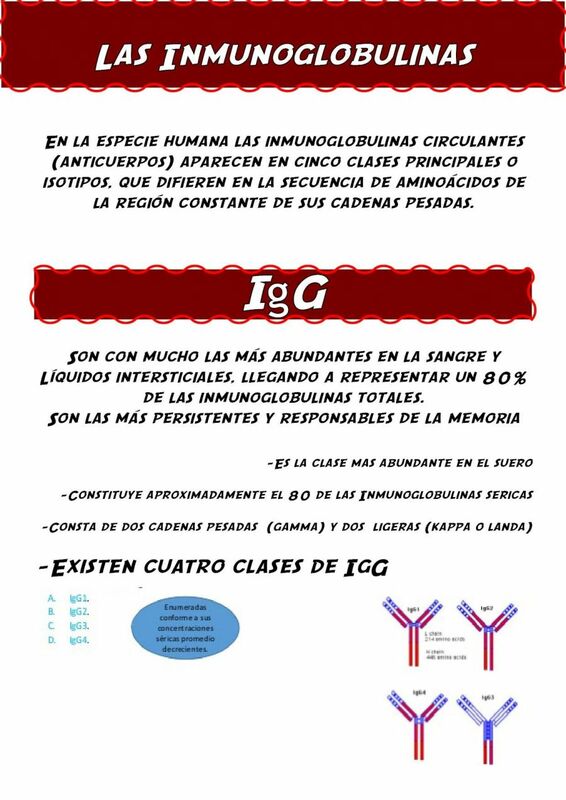 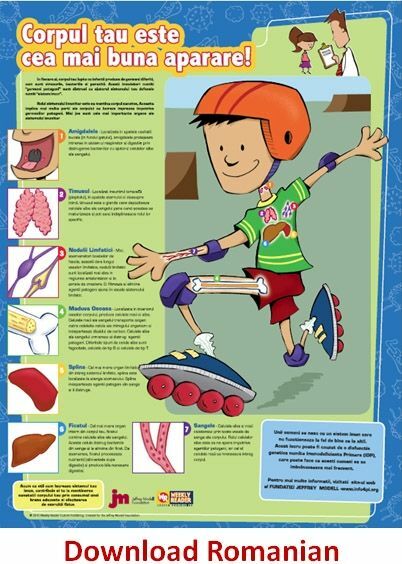 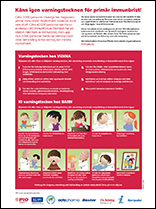 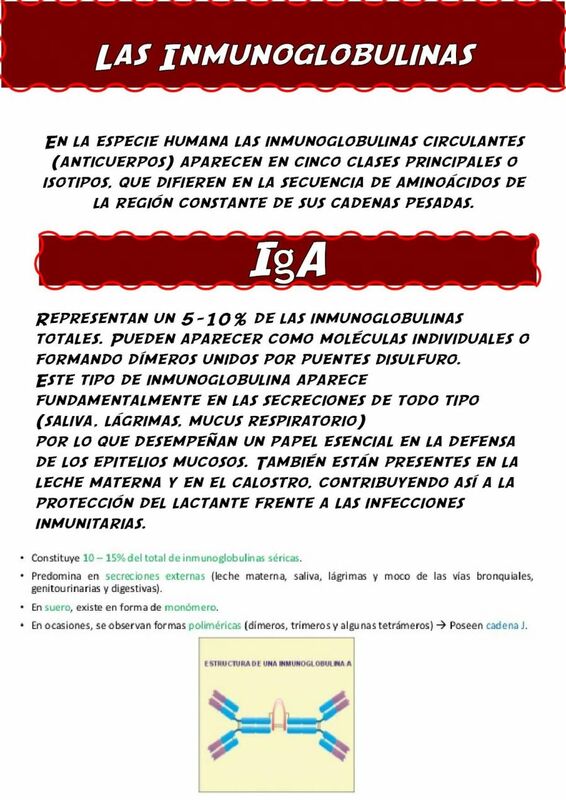 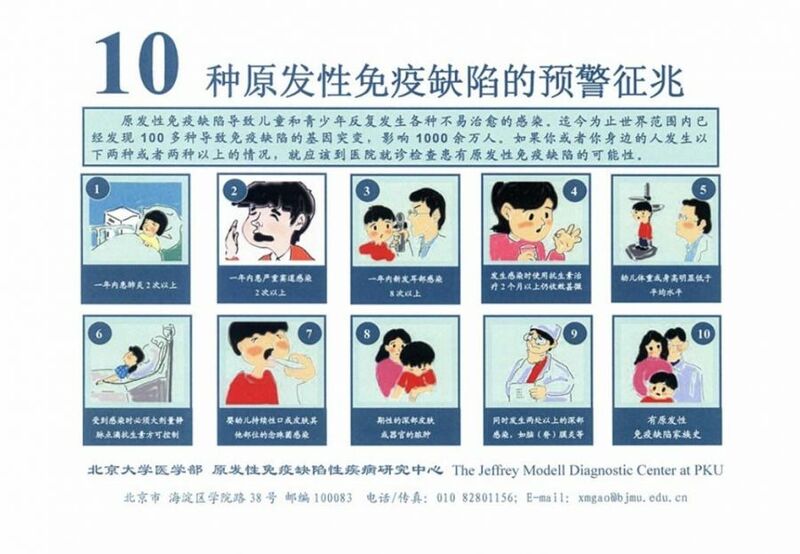 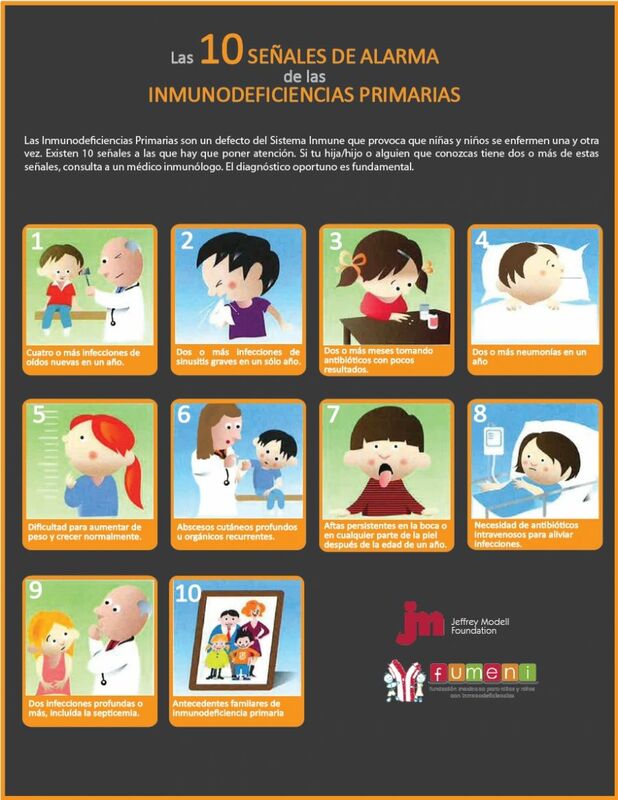 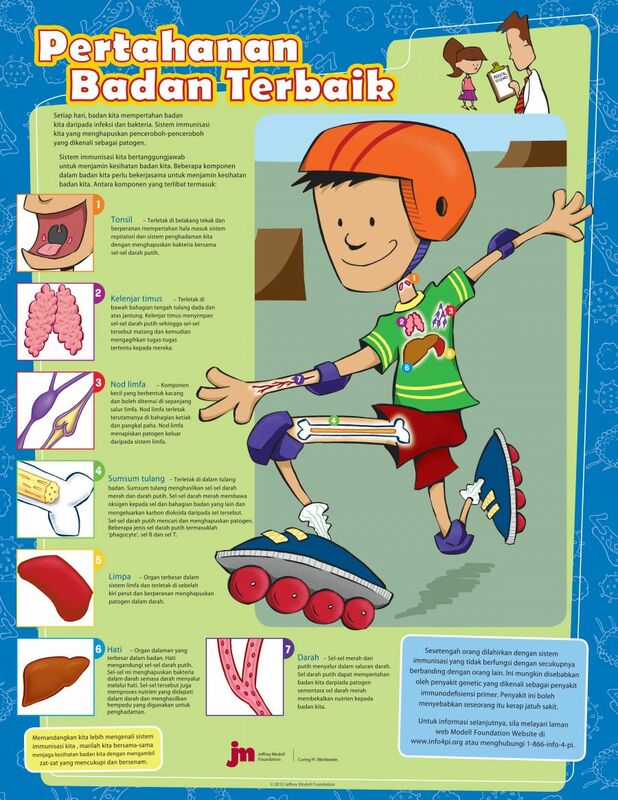 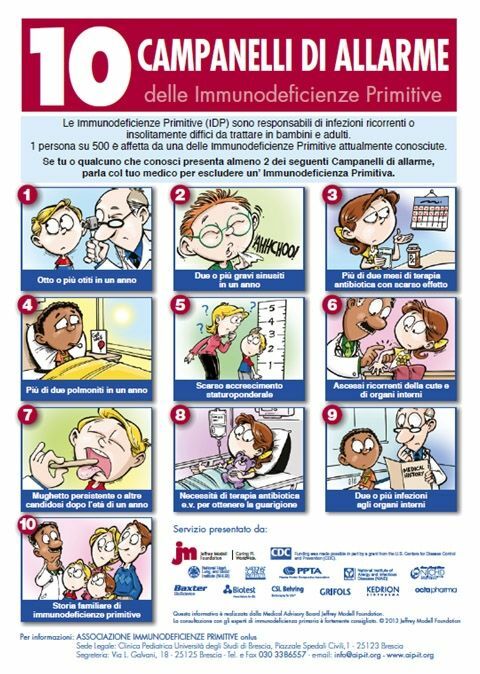 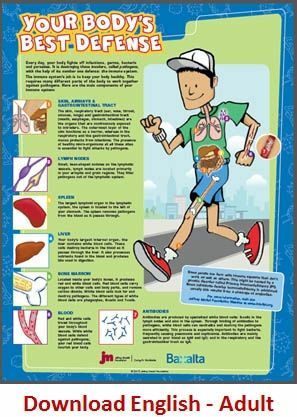 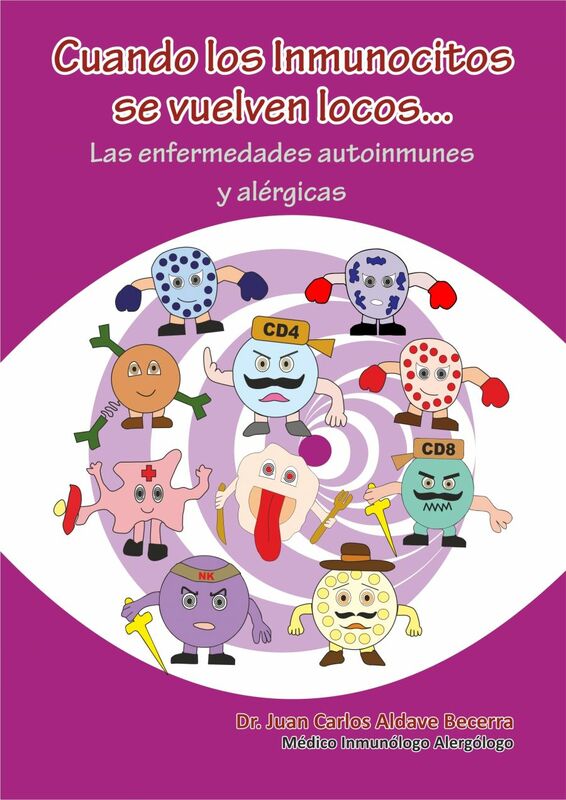 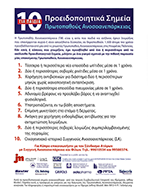 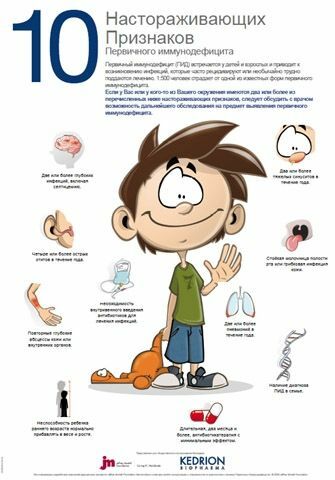 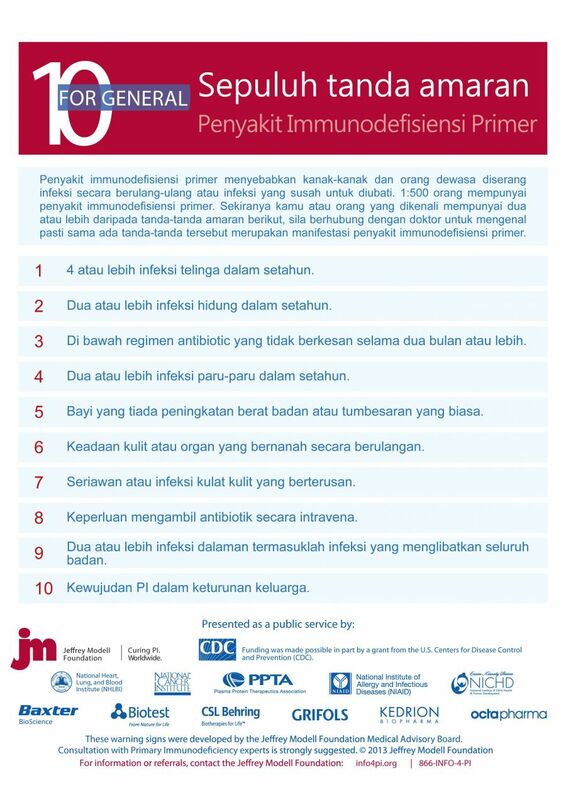 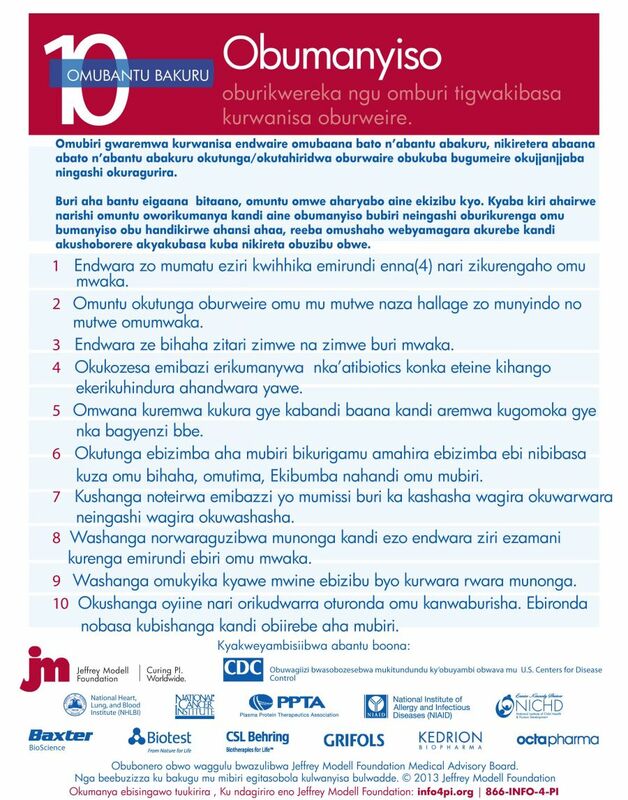 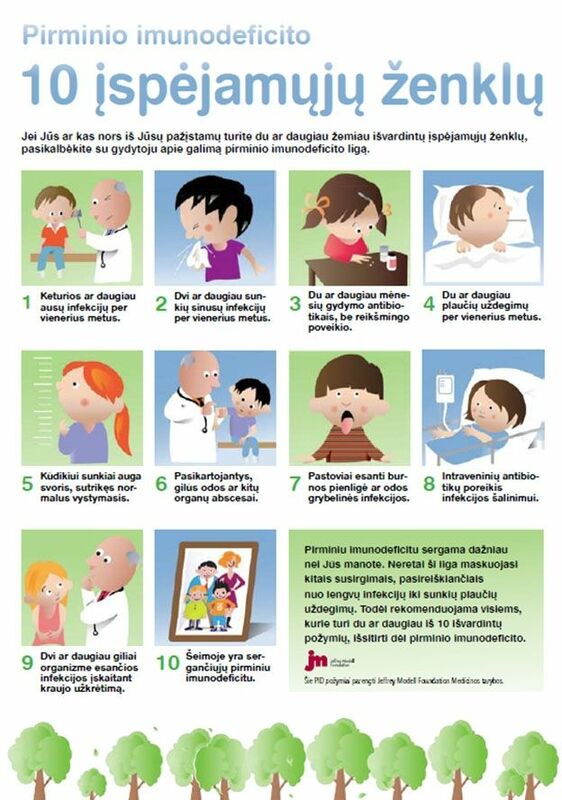 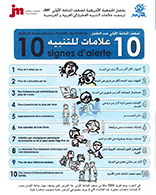 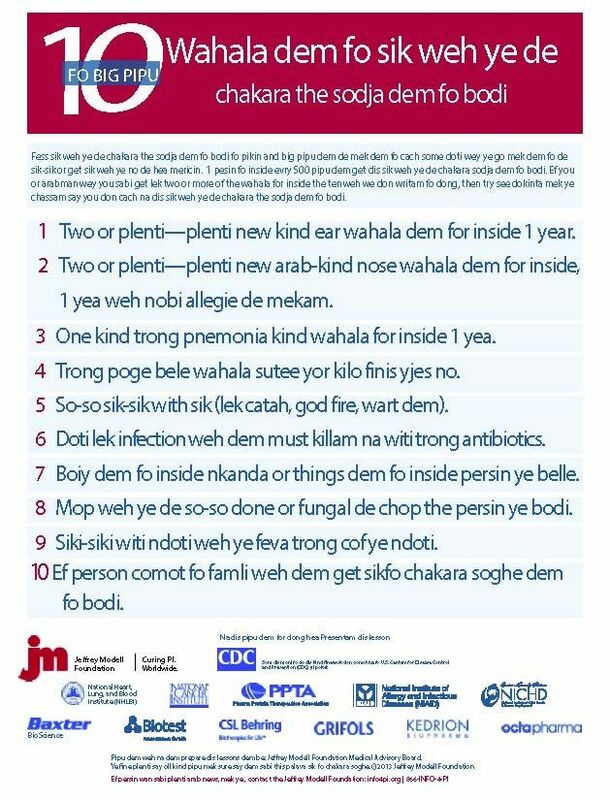 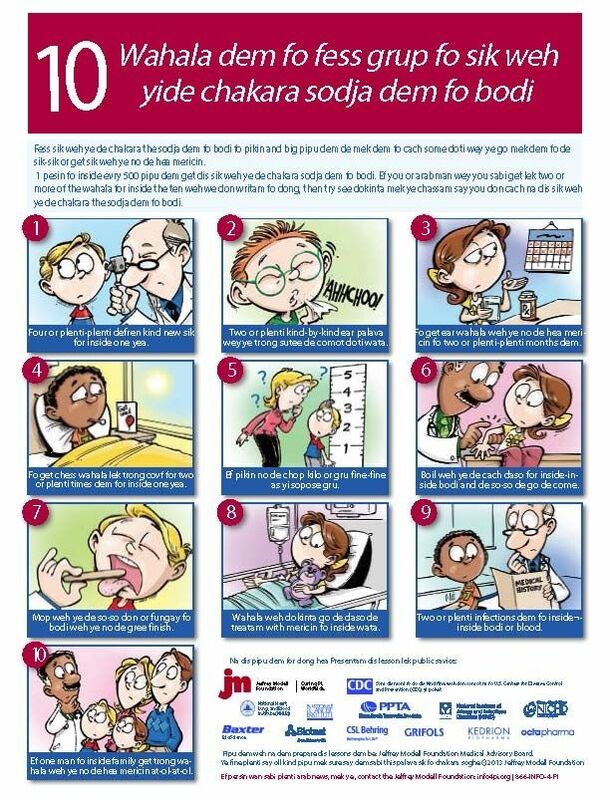 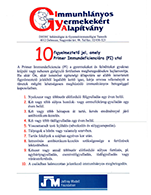 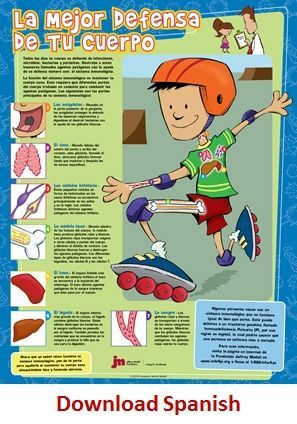 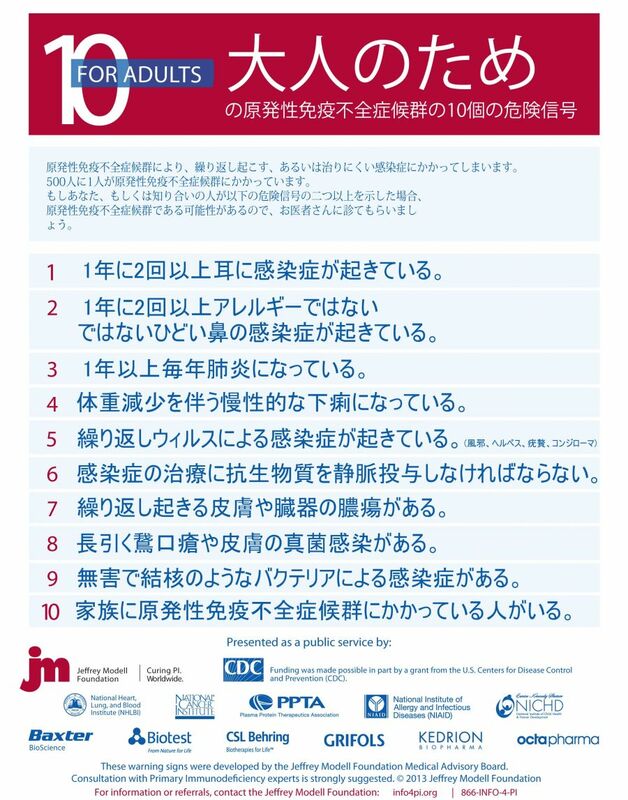 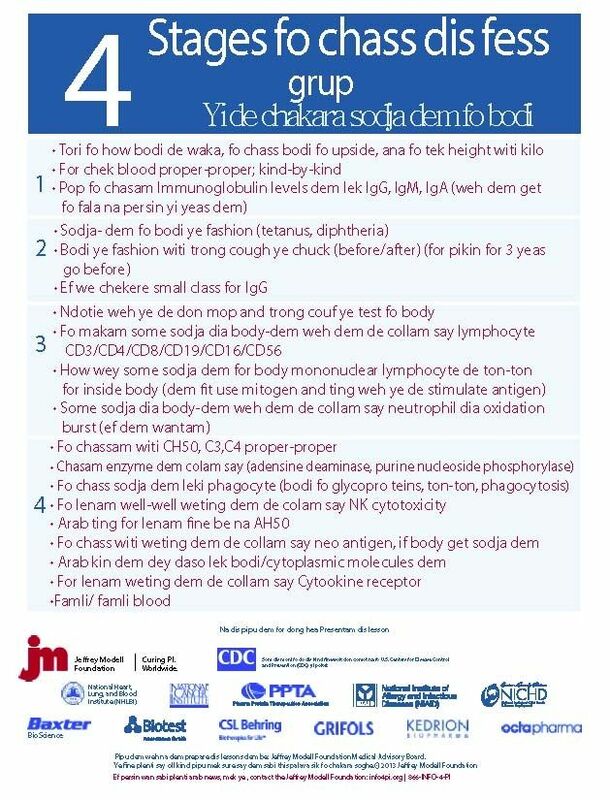 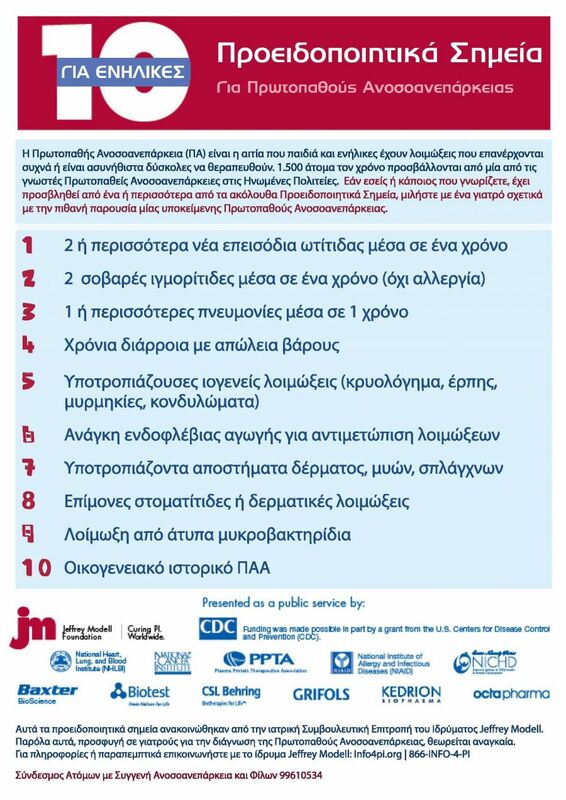 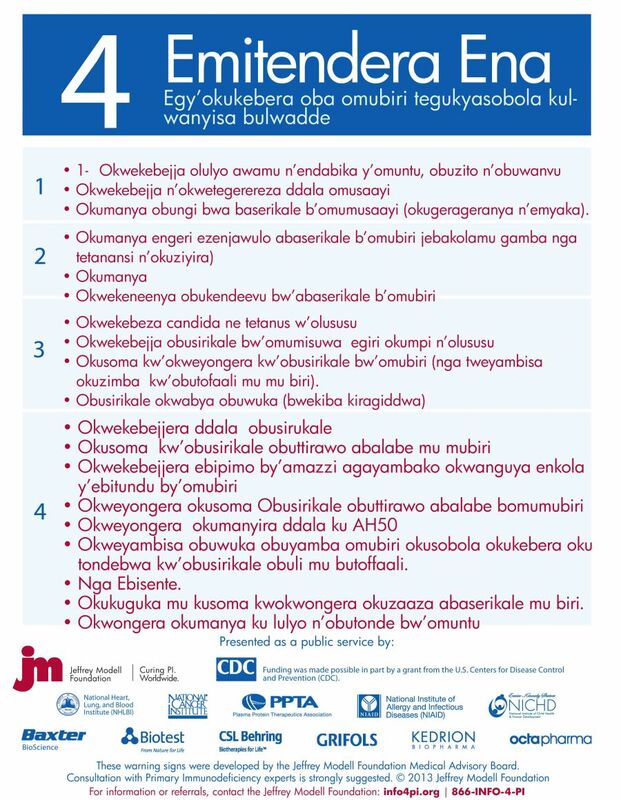 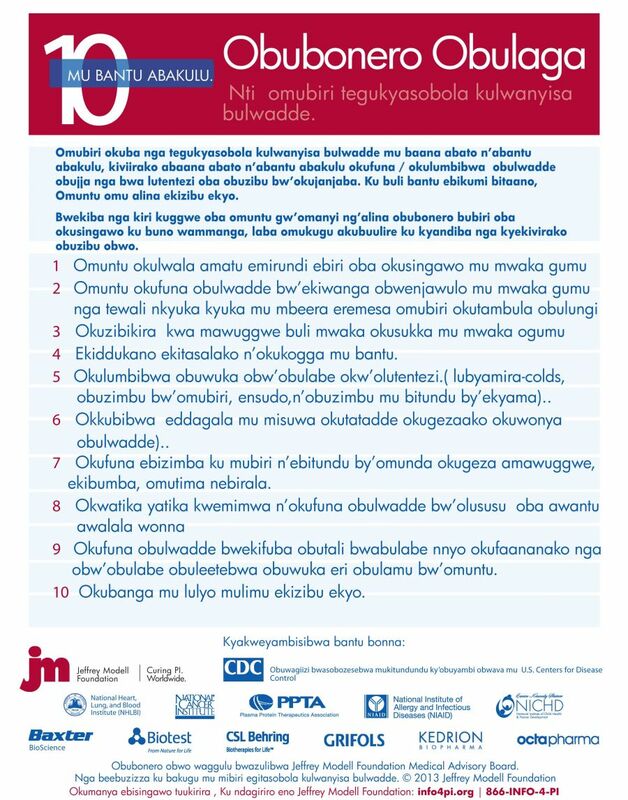 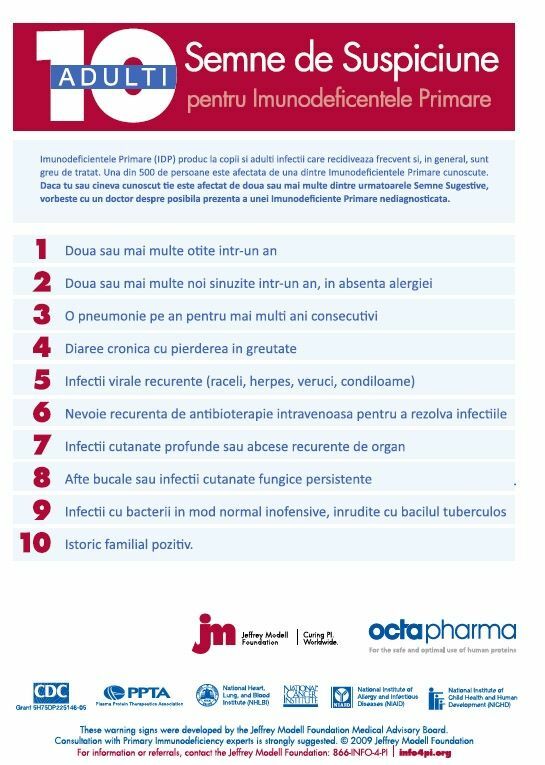 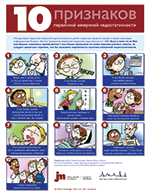 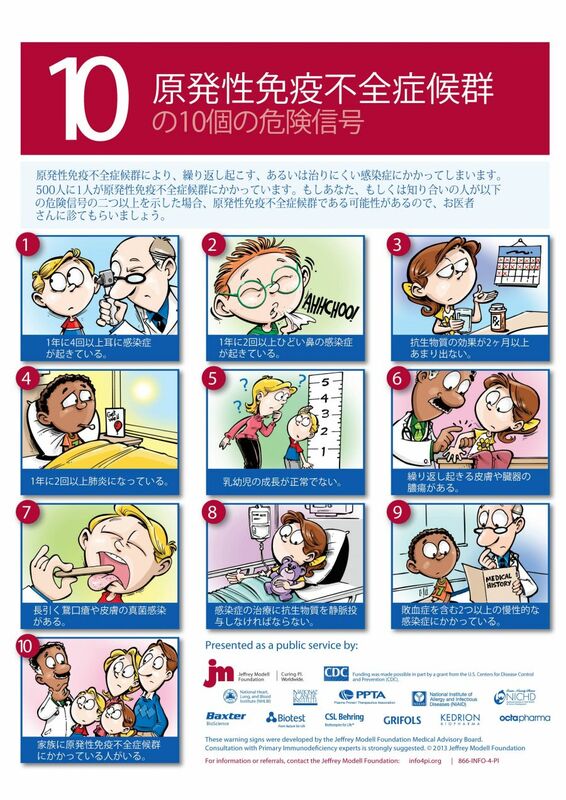 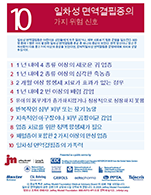 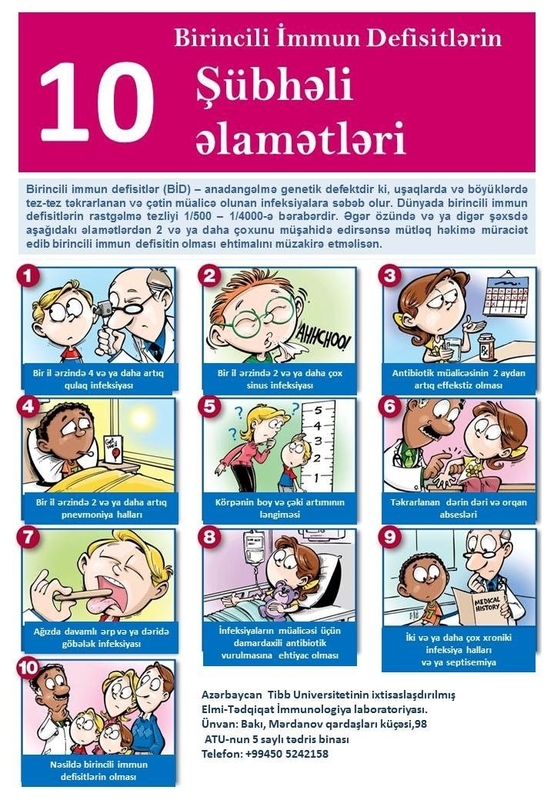 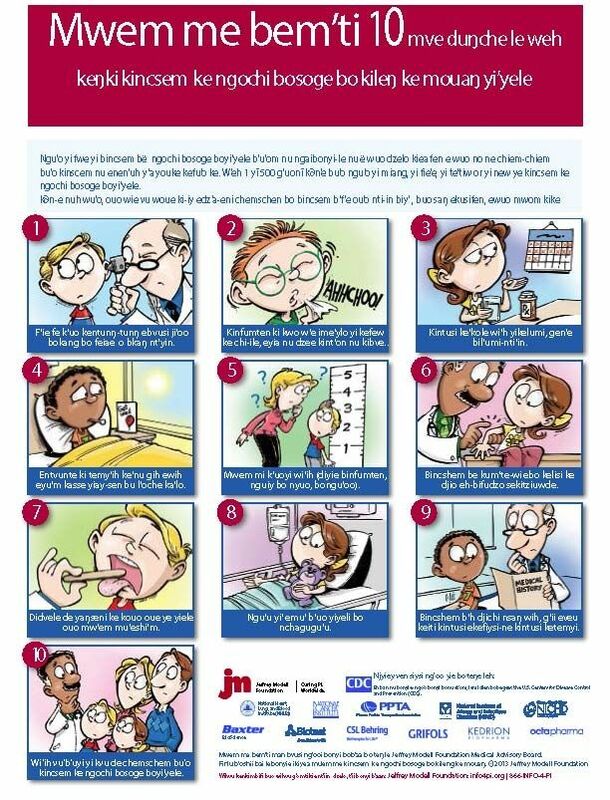 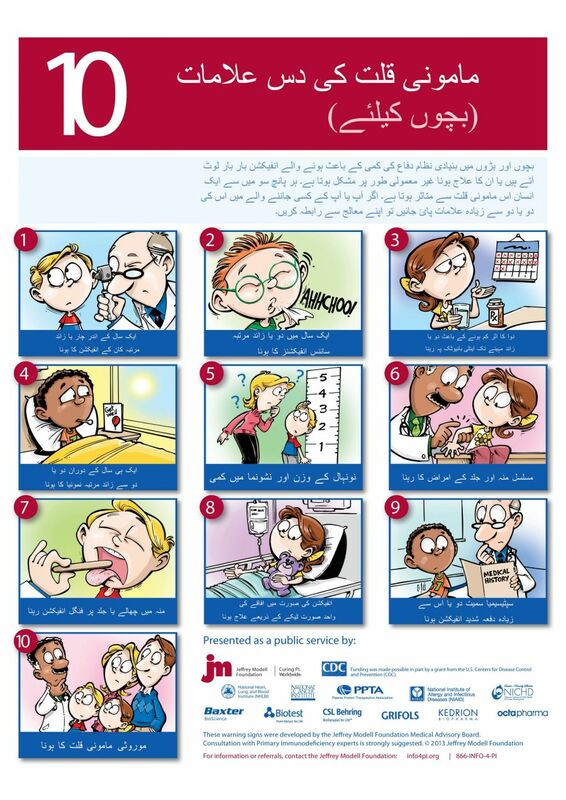 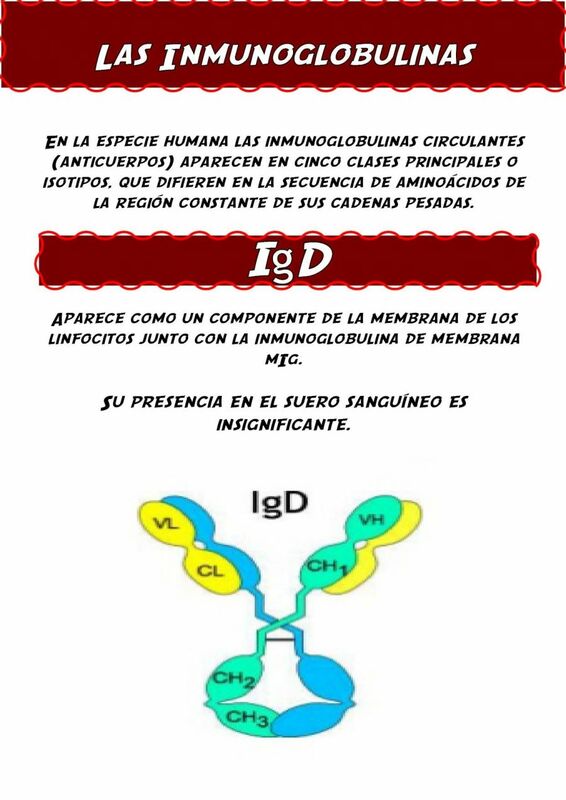 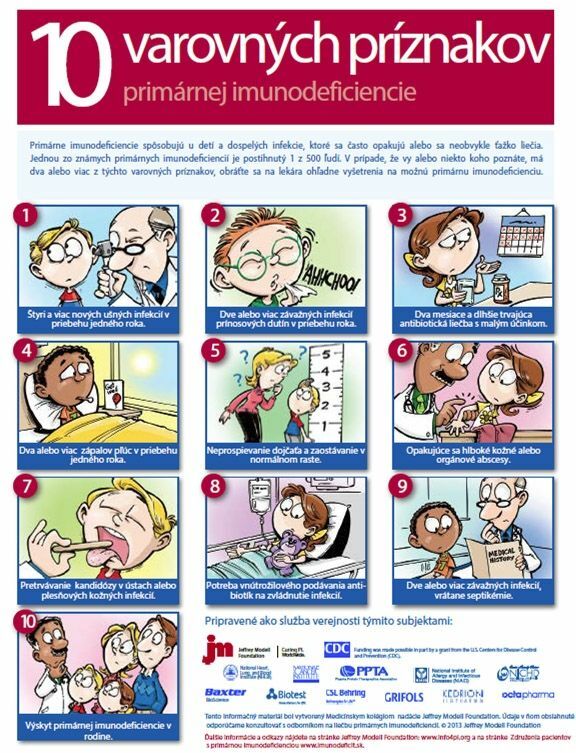 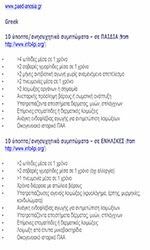 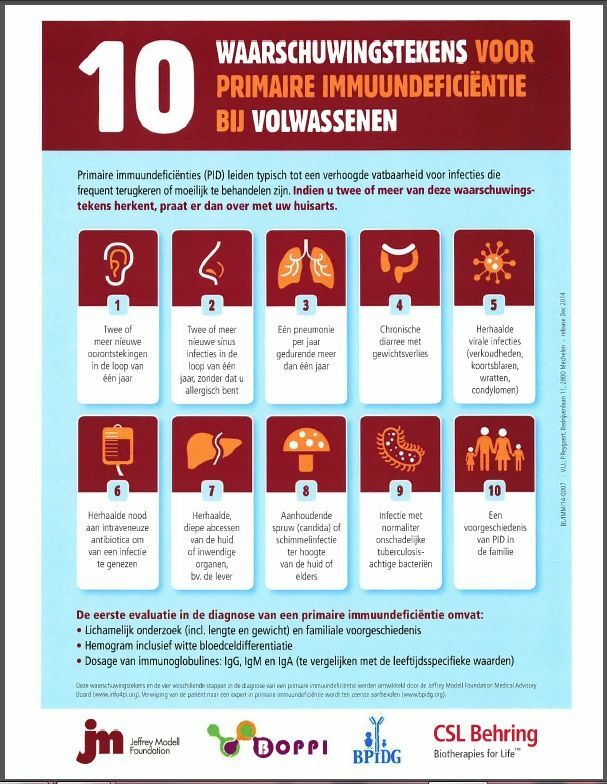 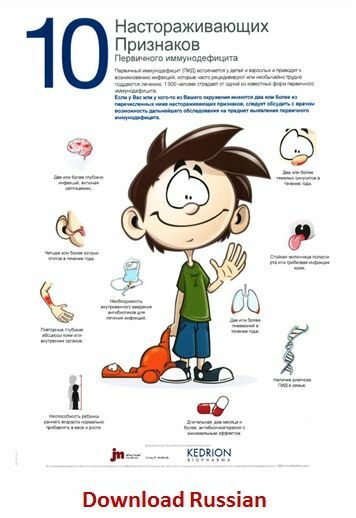 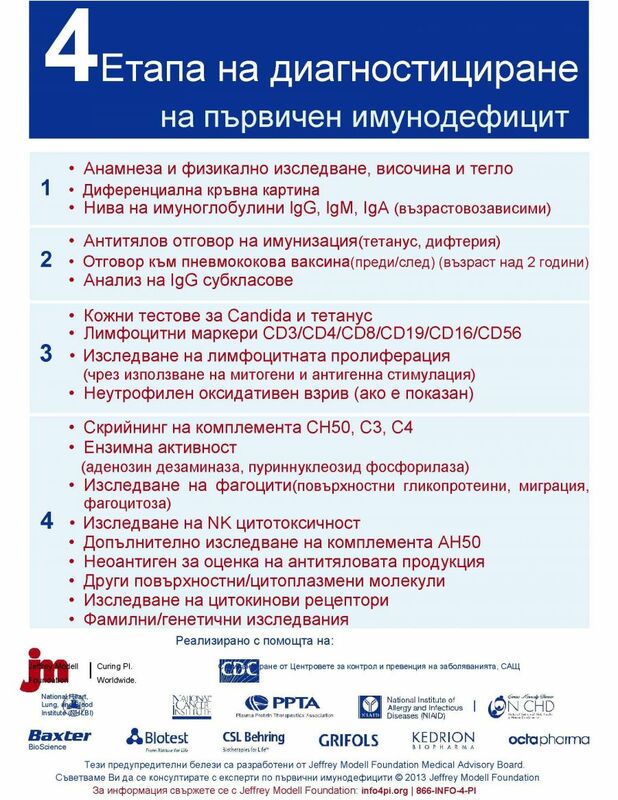 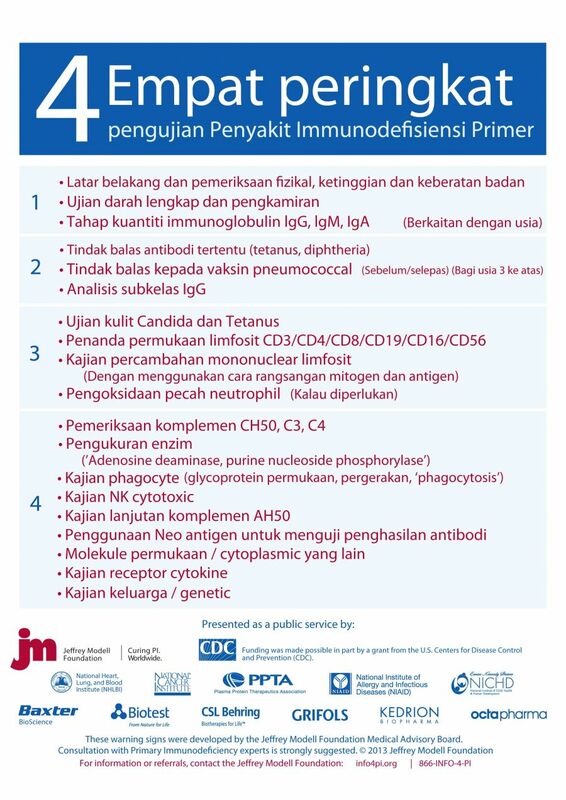 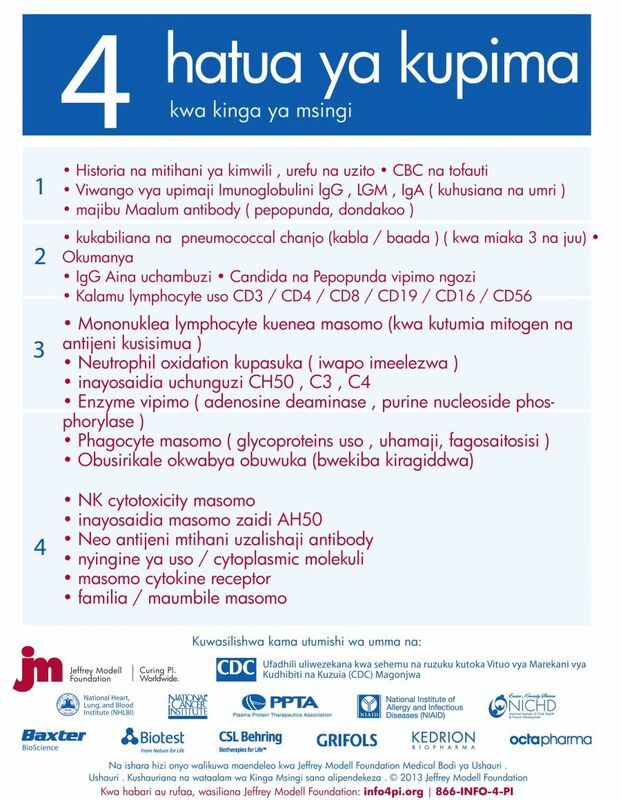 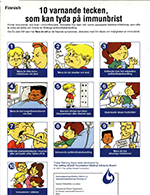 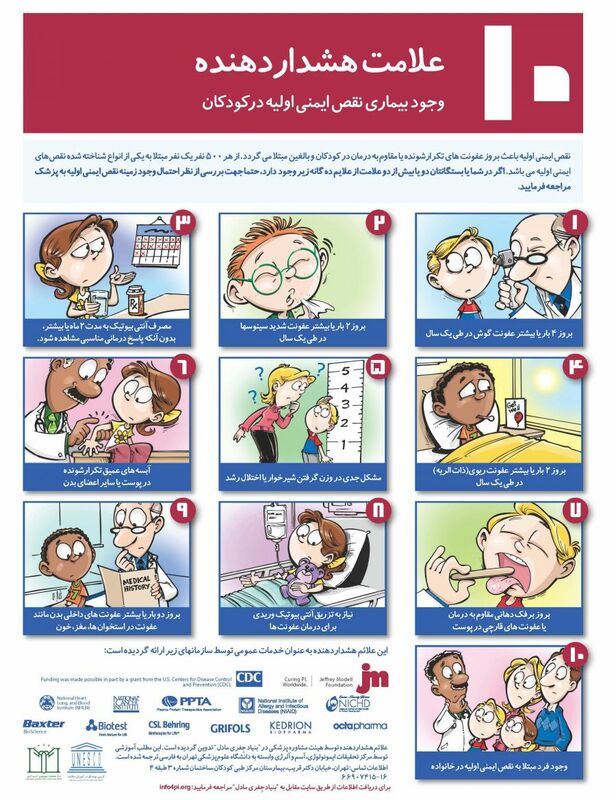 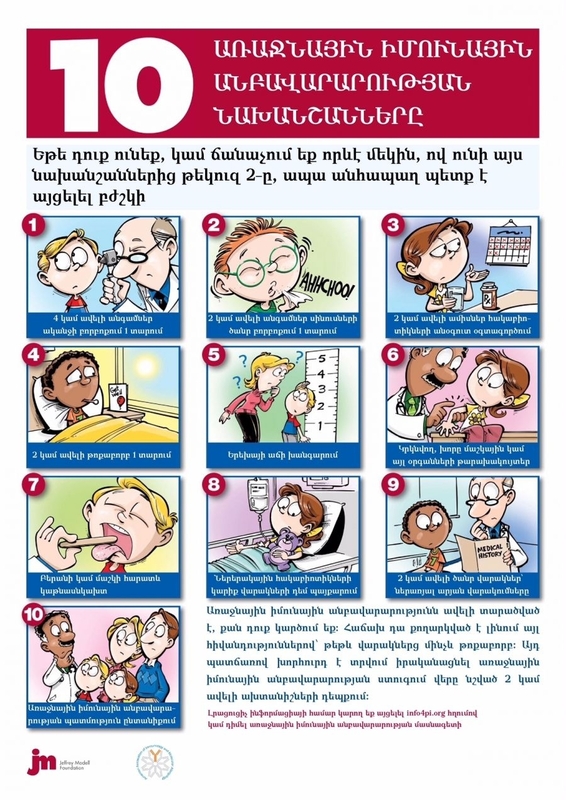 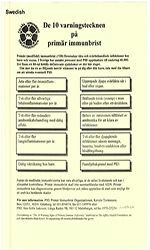 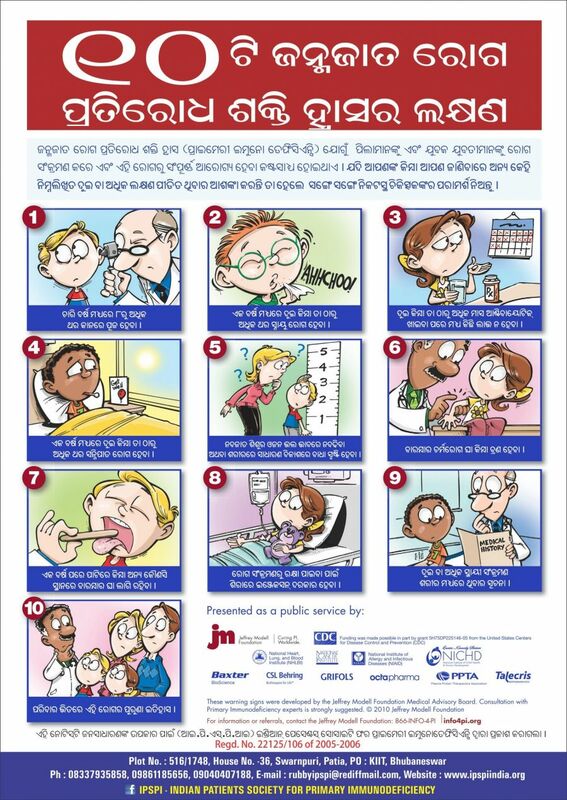 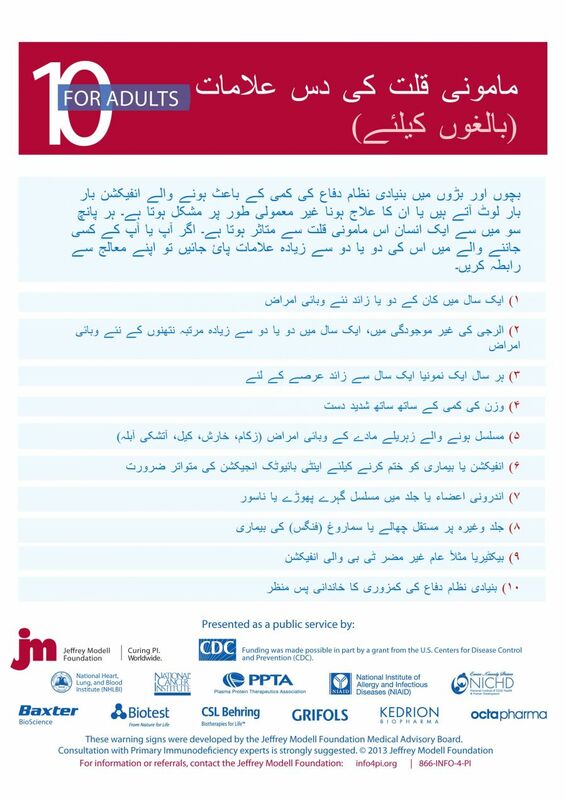 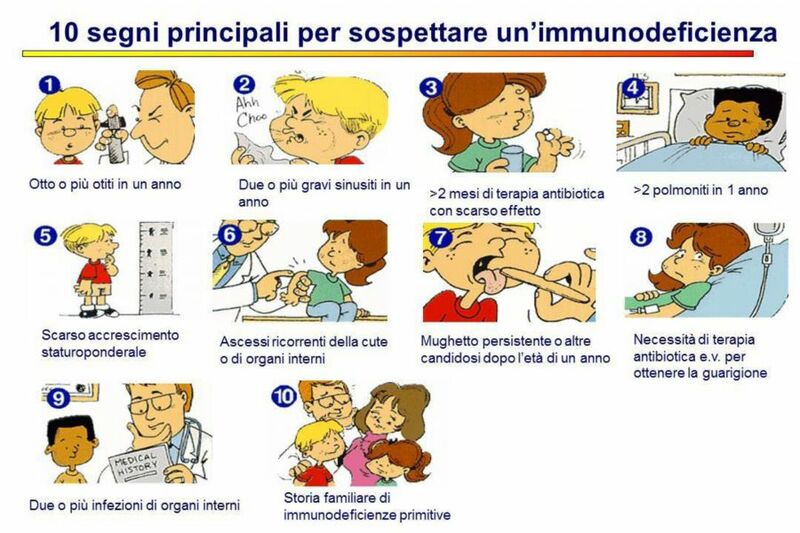 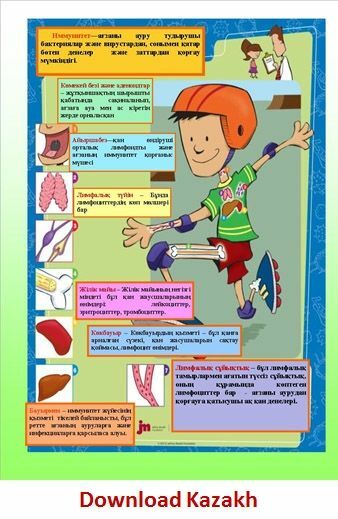 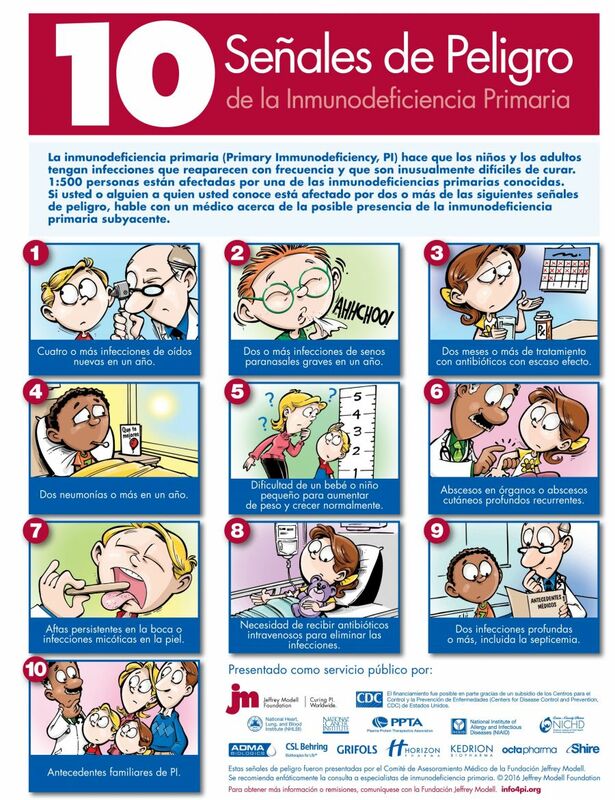 In addition to the 10 Warning Signs Posters we have produced the following educational materials to inform the public about Primary Immunodeficiency. 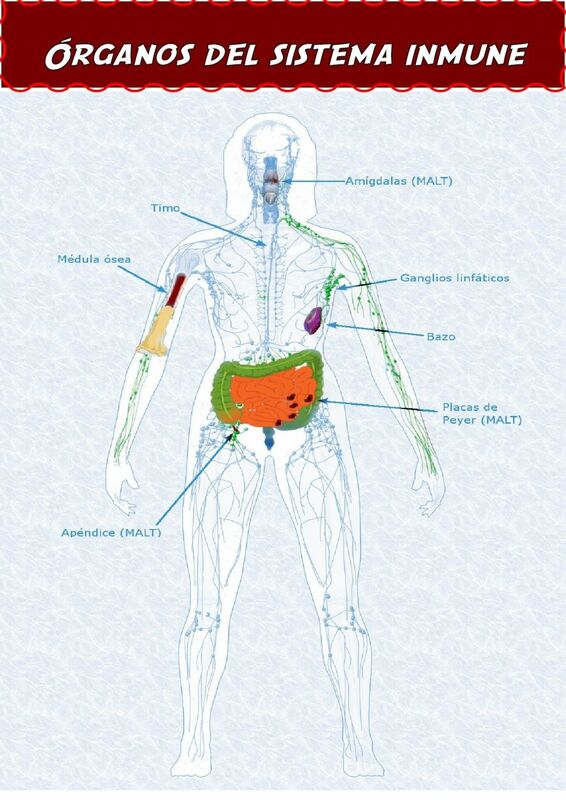 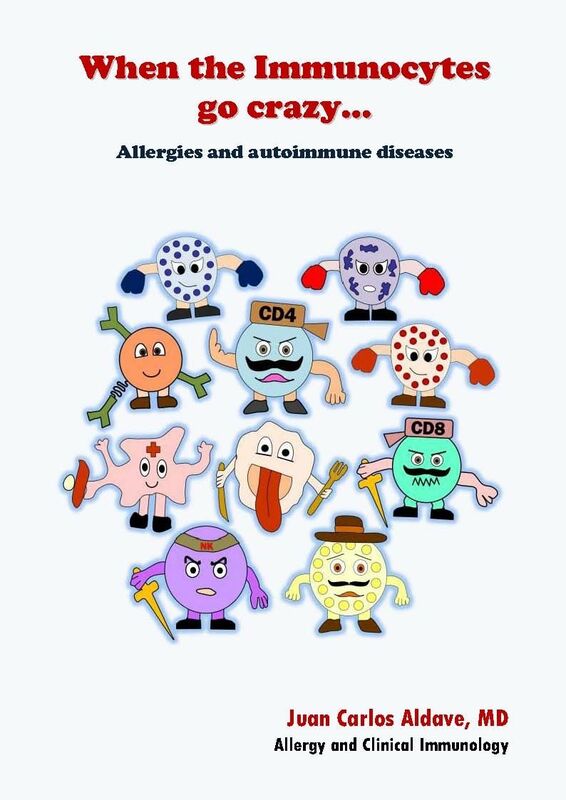 An educational illustration of how our immune system works. 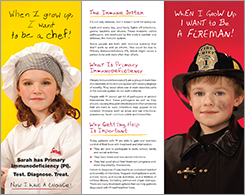 A pocket-sized guide to PI. 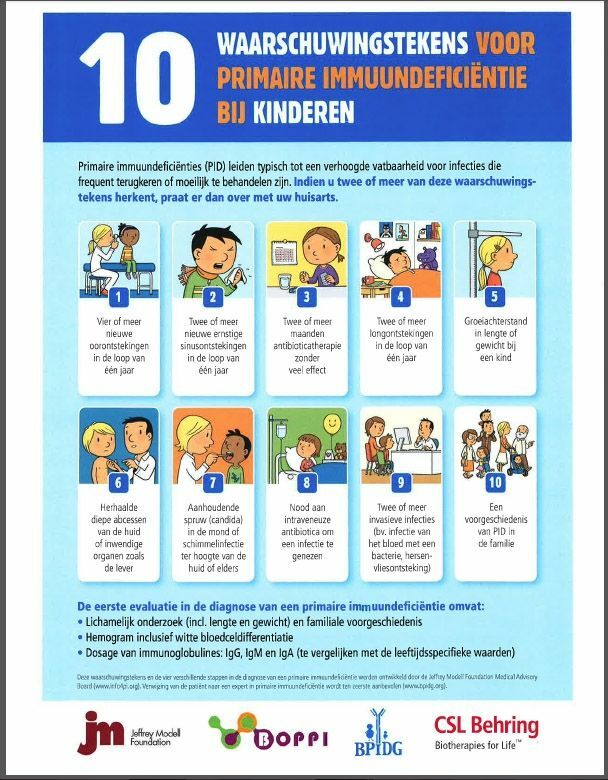 A detailed and informative guide to PI. 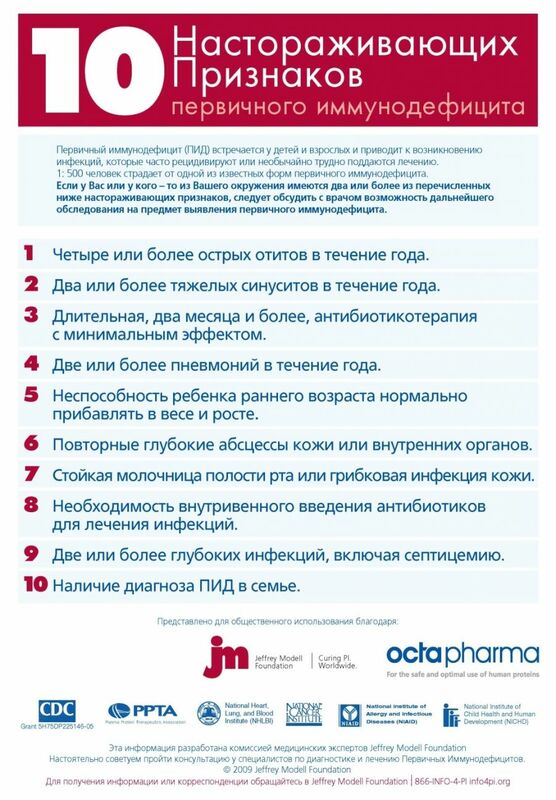 As well as in collaboration with our pharmaceutical partners! 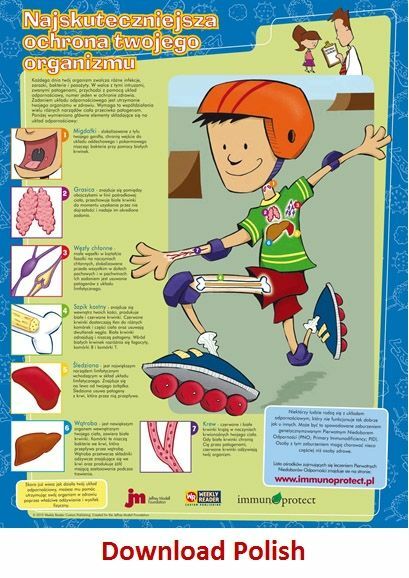 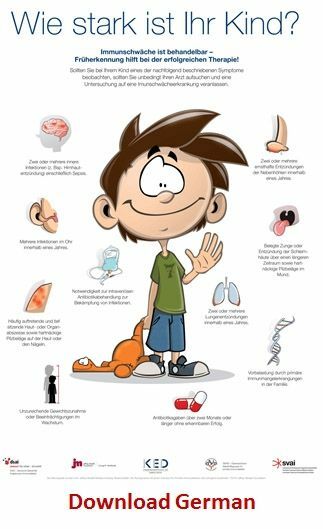 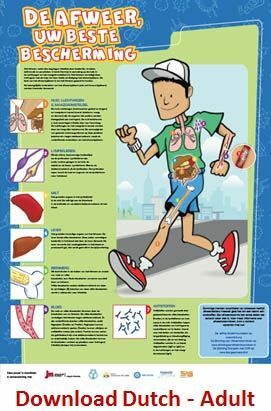 The Importance of the Immune System! 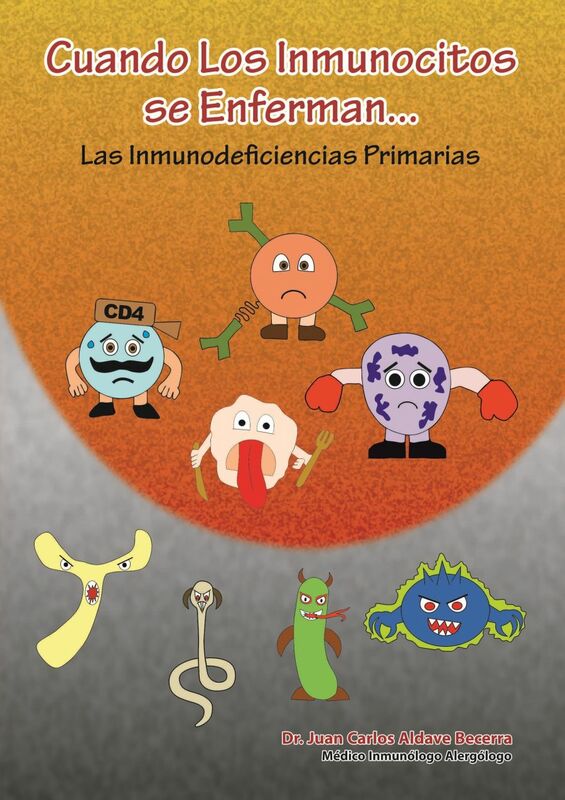 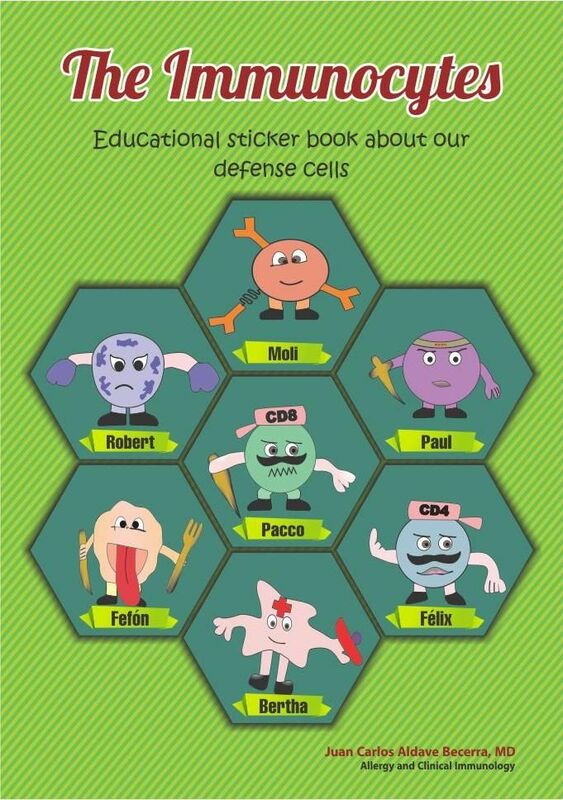 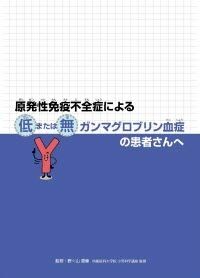 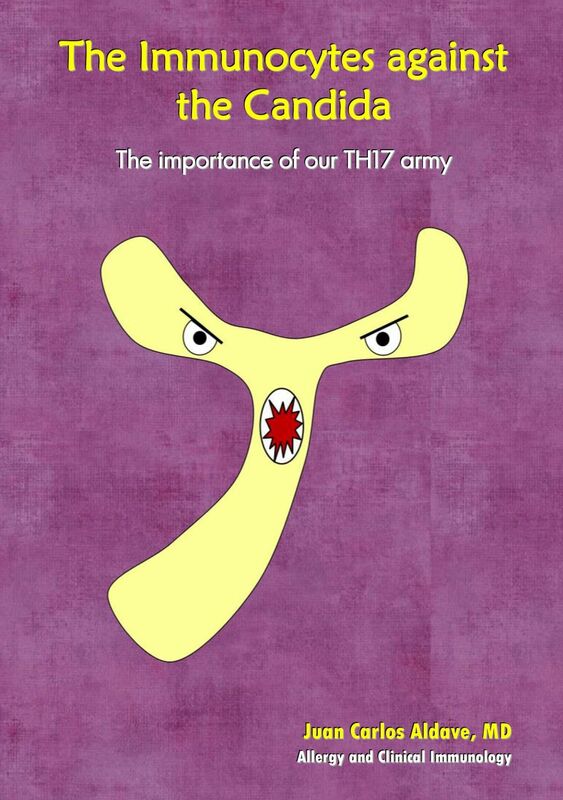 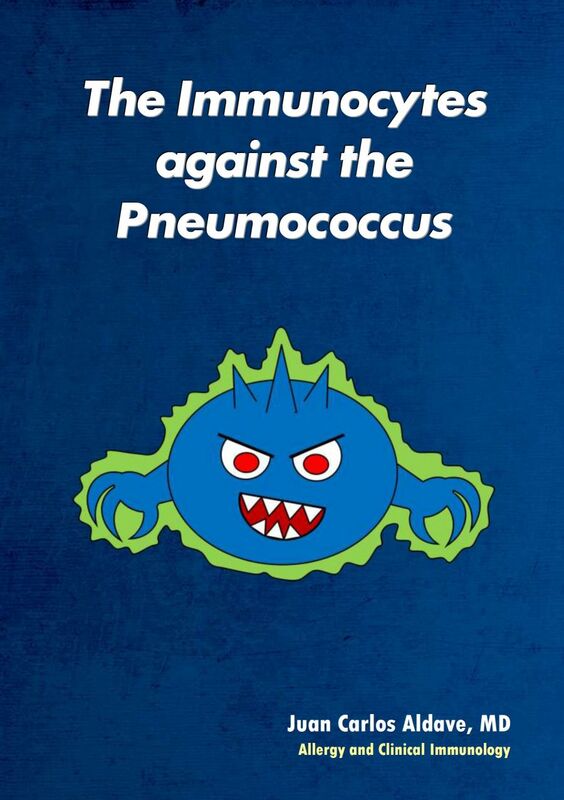 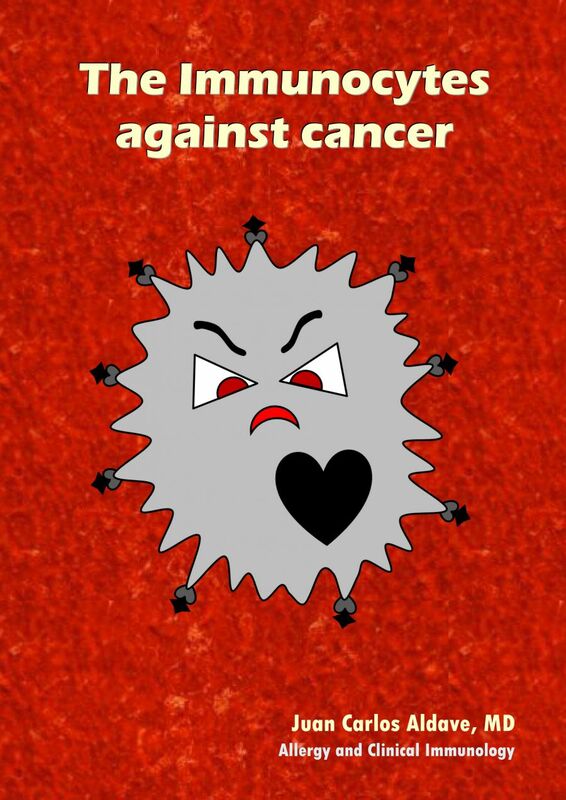 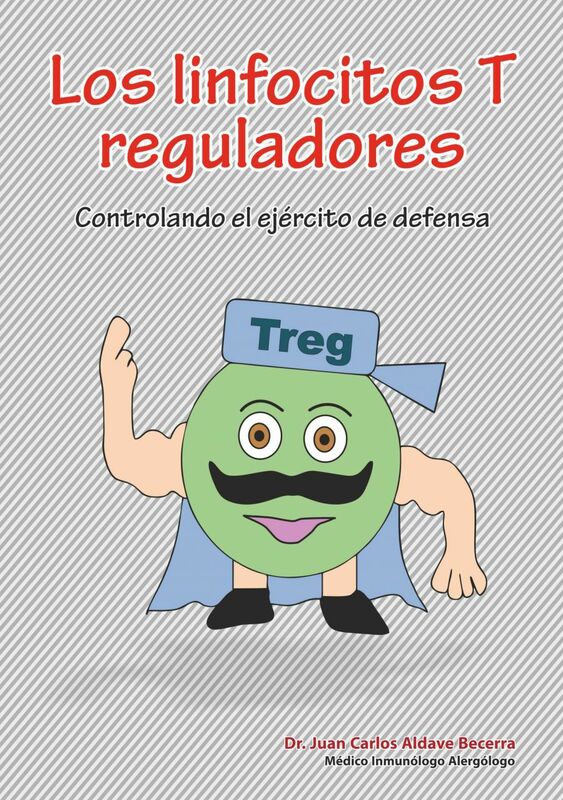 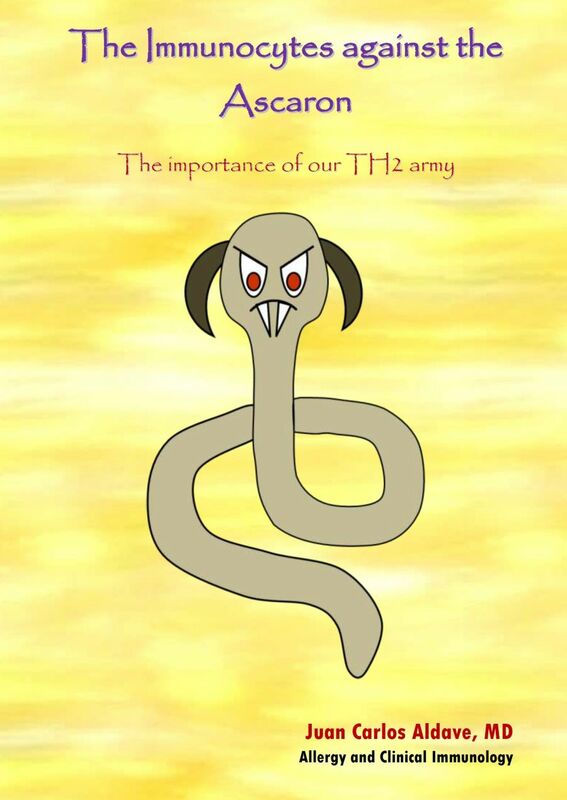 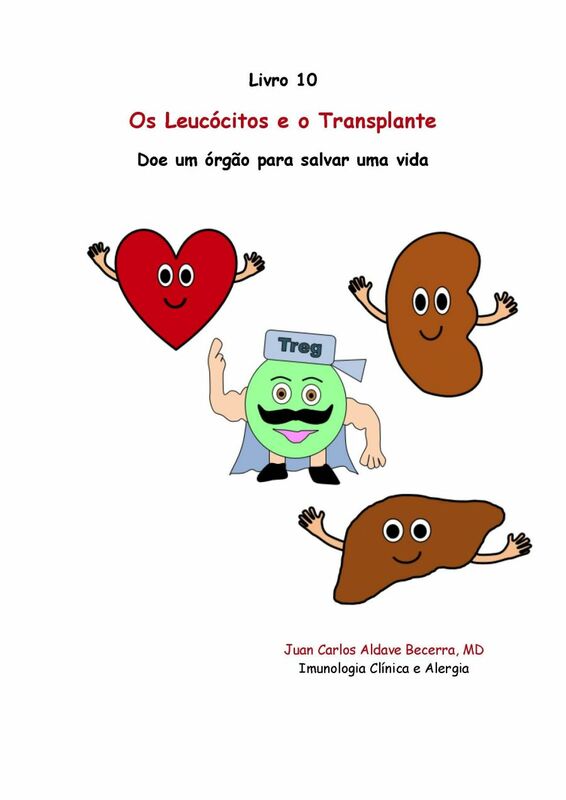 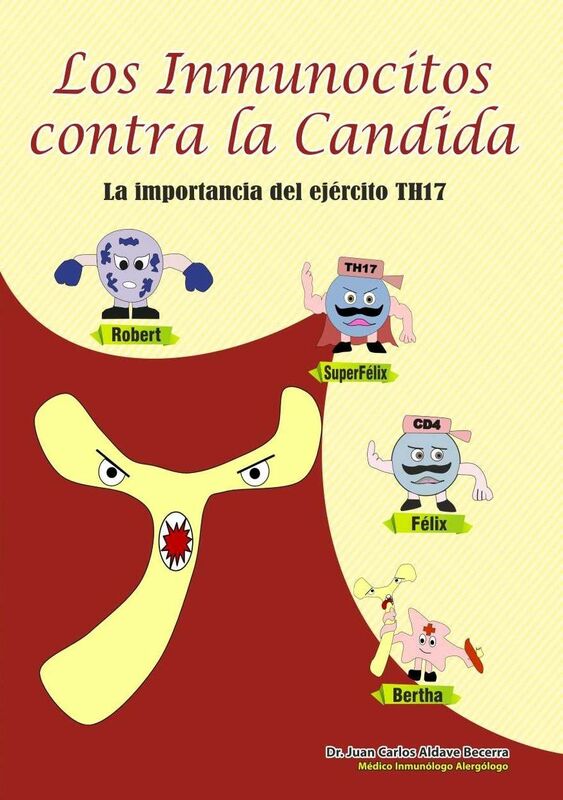 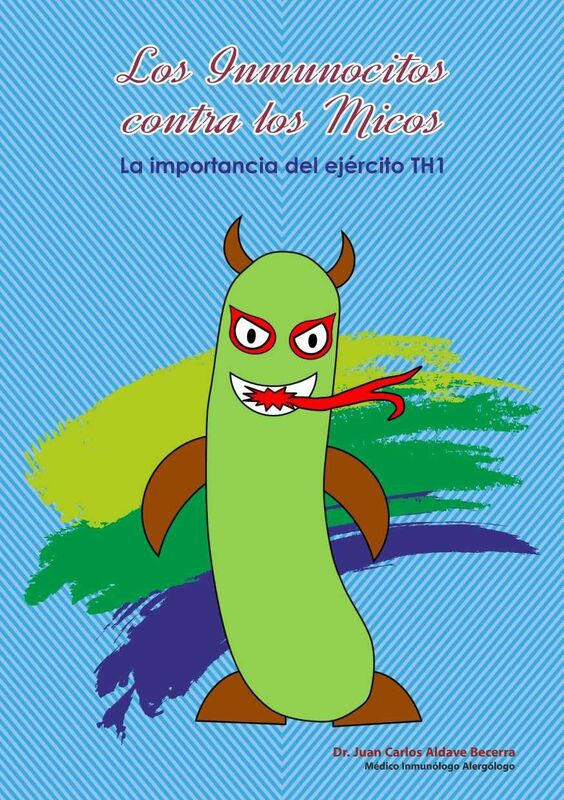 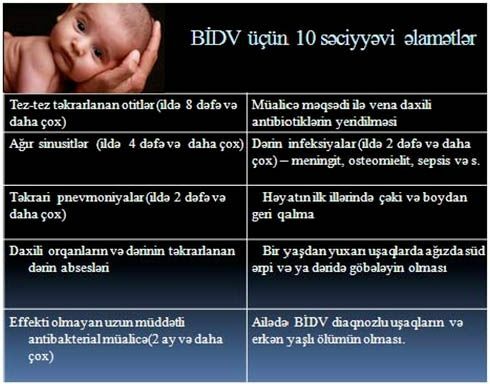 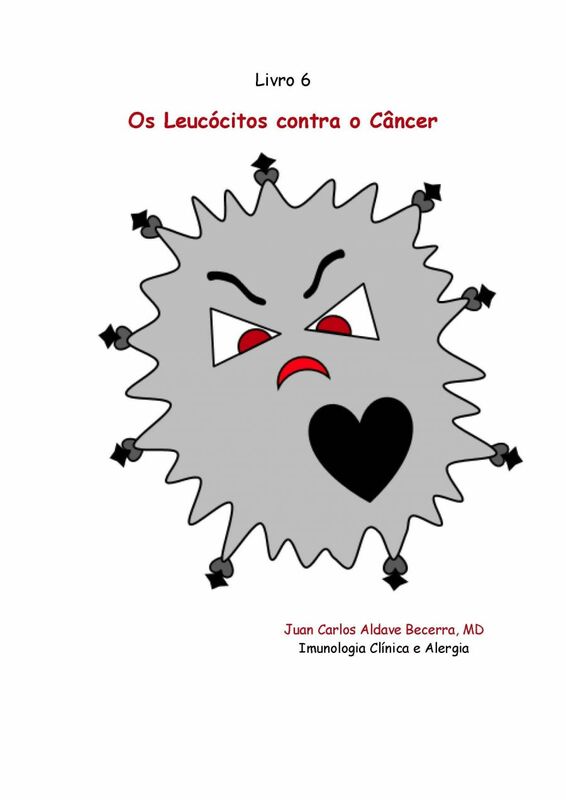 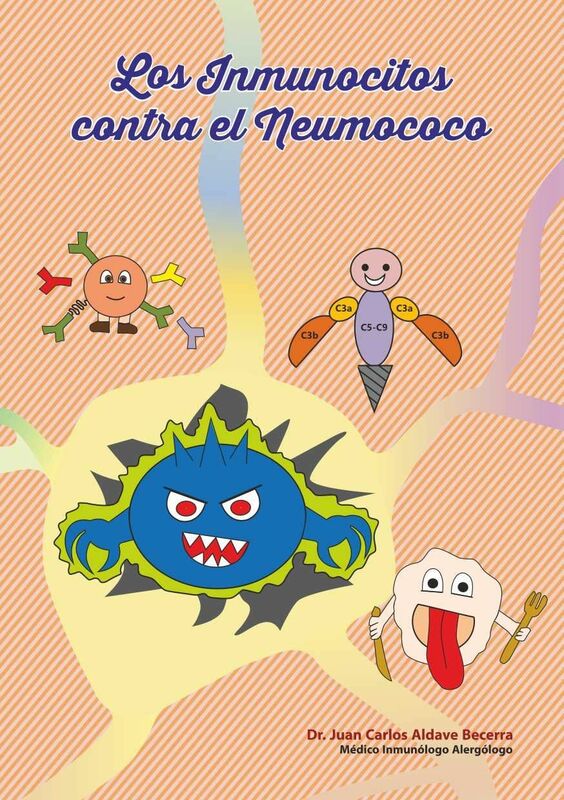 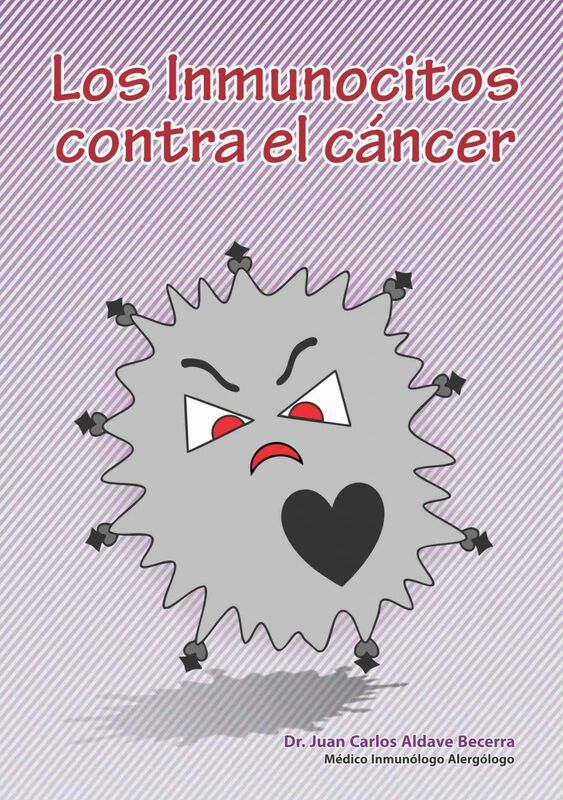 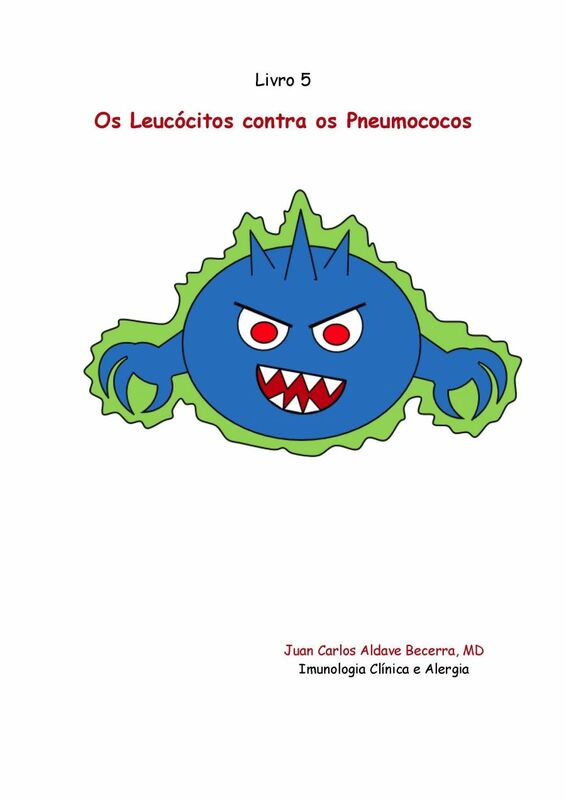 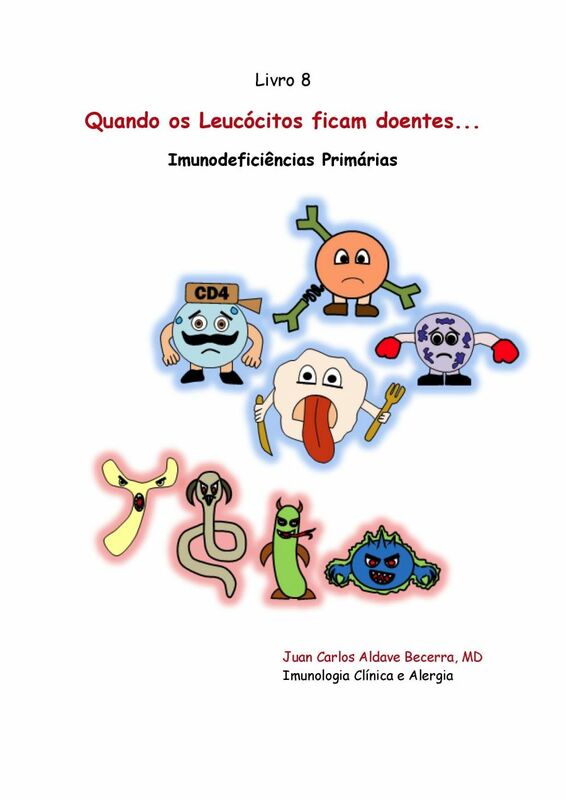 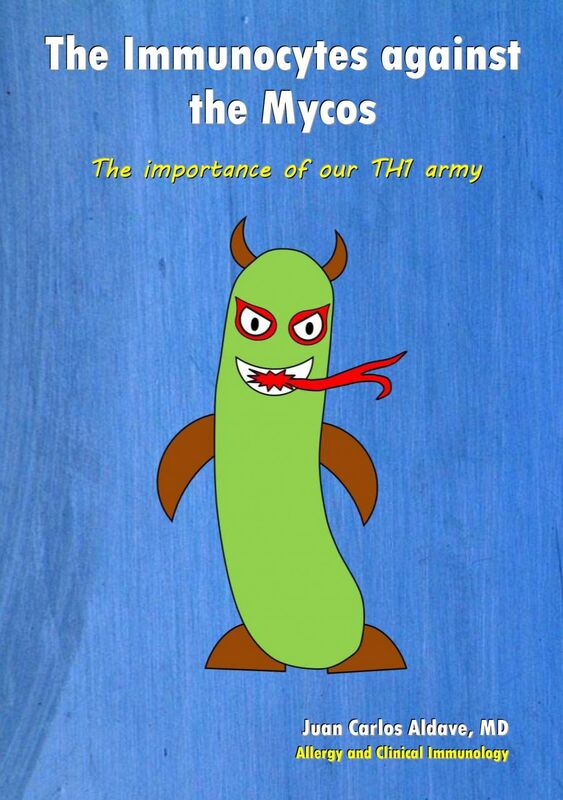 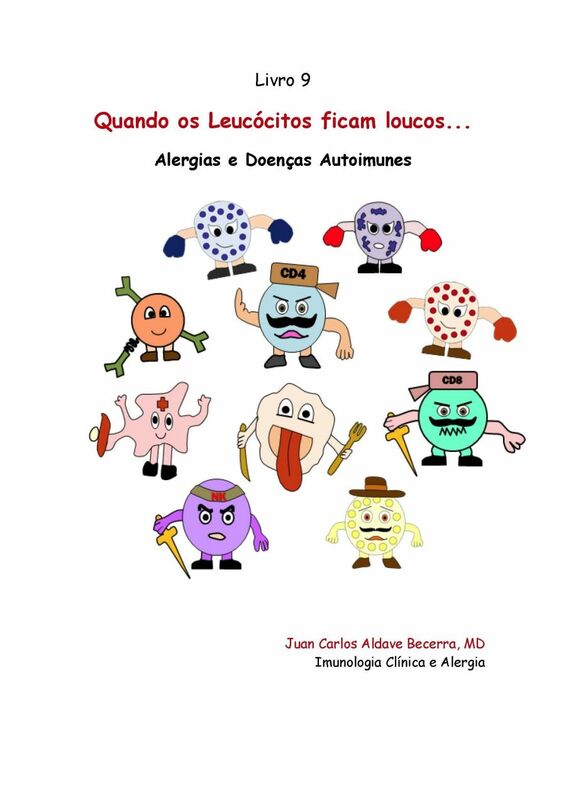 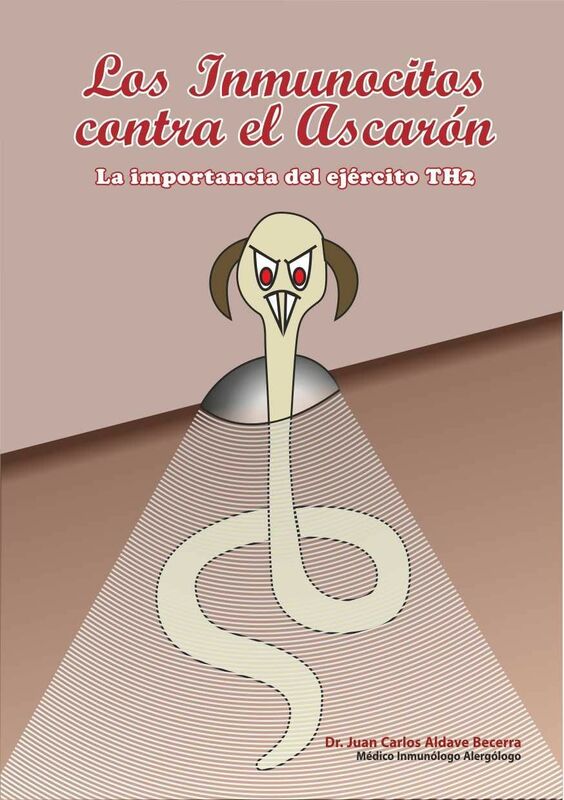 Funny Immunology To Save Lives! 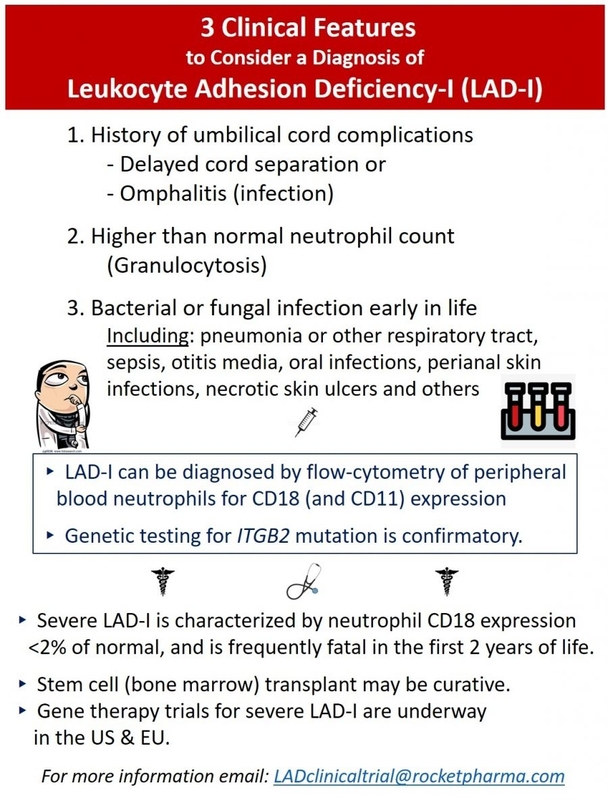 The FILL (Following infants with low lymphocytes) study developed as an offshoot and direct result of newborn screening for SCID and T cell lymphopenia (NBS SCID) in the United States. 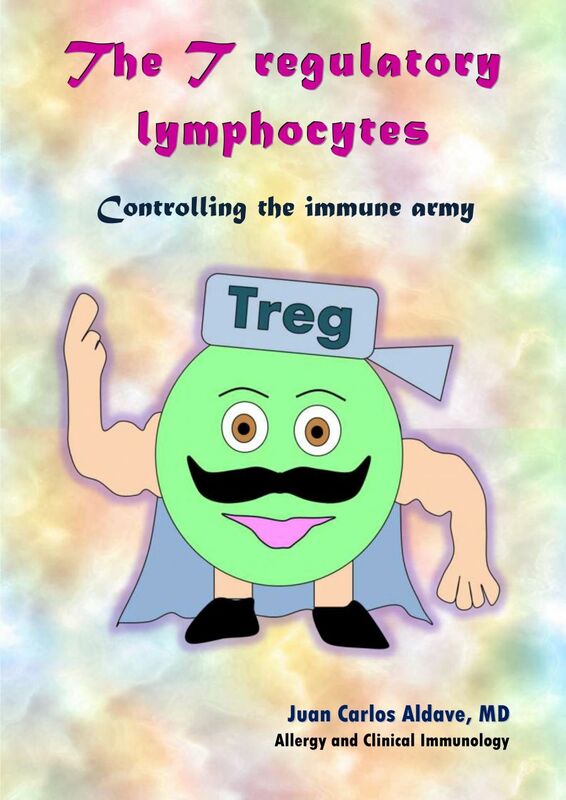 This study intends to enroll infants who are initially identified during newborn screening (abnormal TREC result on SCID screening) and confirmed by a physician to have lymphopenia. The study will collect data on 200 infants who are enrolled by April 1, 2018. 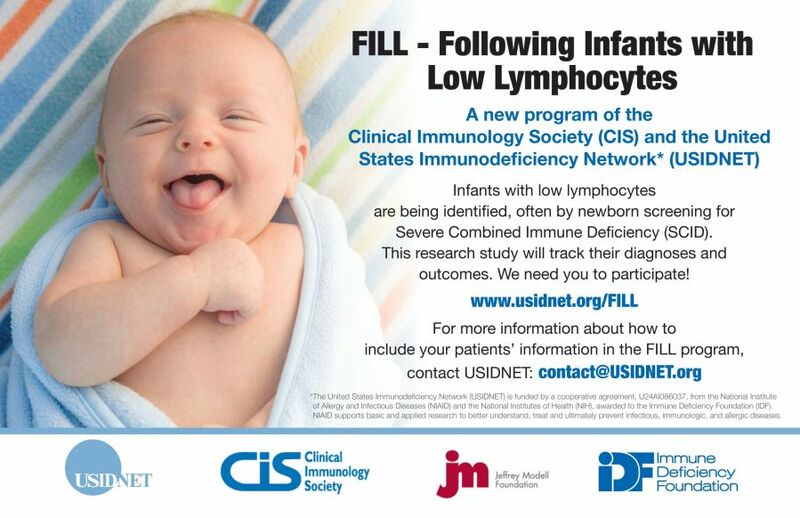 The FILL database was created and is maintained by the USIDNET, through a pilot grant provided by the Jeffrey Modell Foundation to the Clinical Immunology Society (CIS). 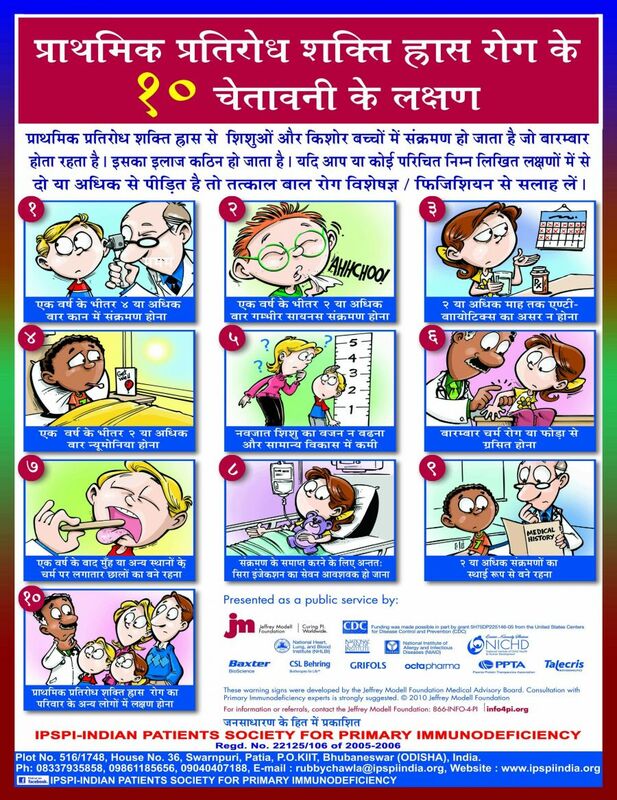 Patient data can be entered into the FILL Database either by enrollment through an USIDNET center, or through direct physician referral to USIDNET. 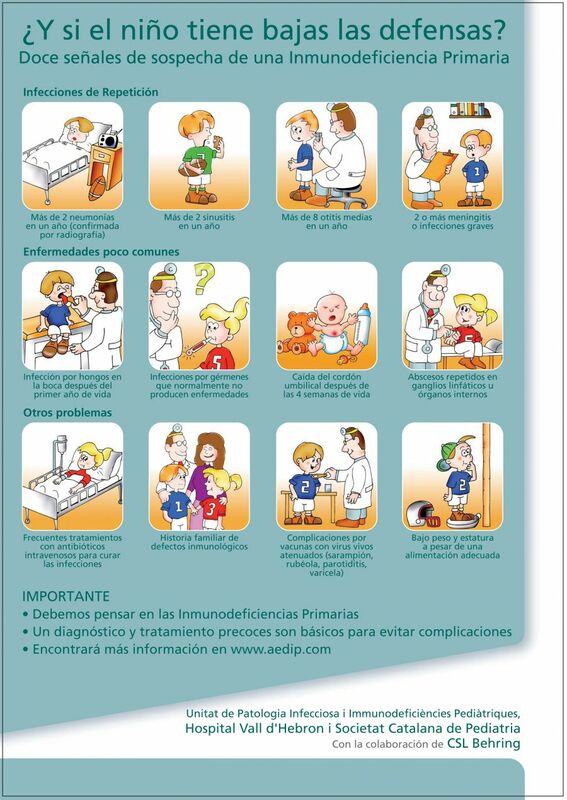 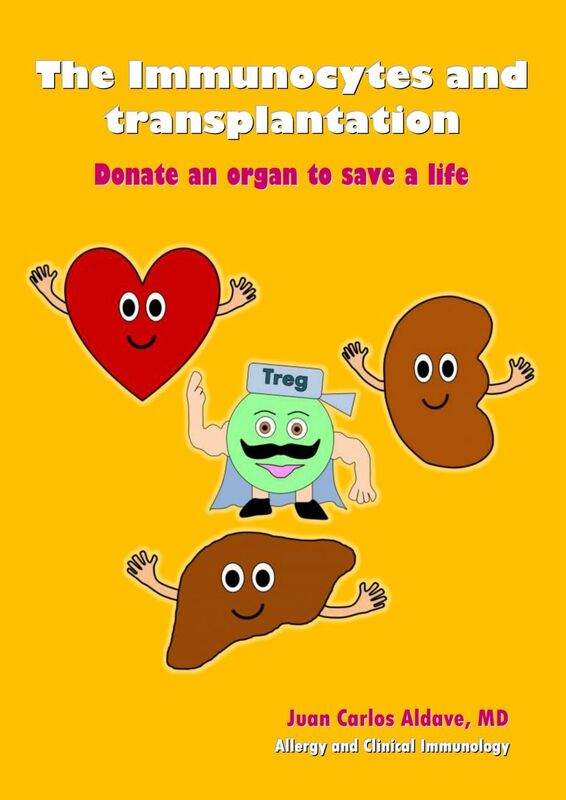 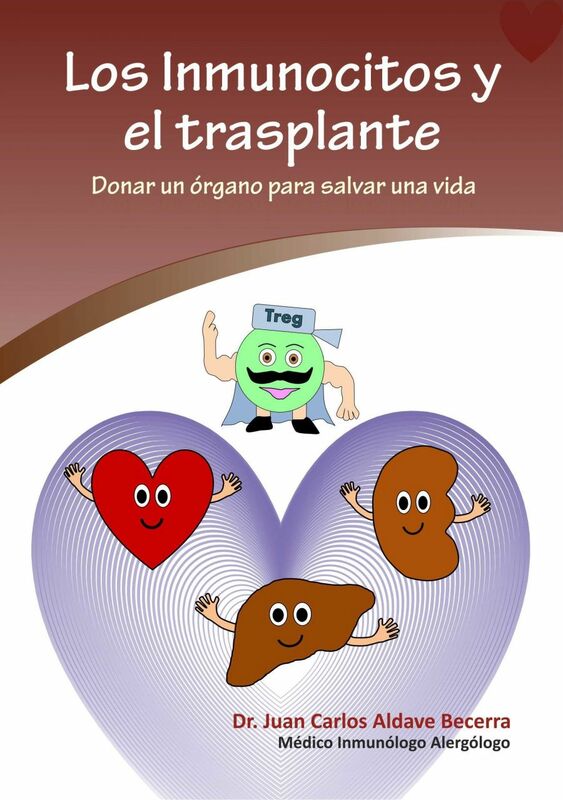 All patients enrolled in the study have to be consented through an IRB protocol. 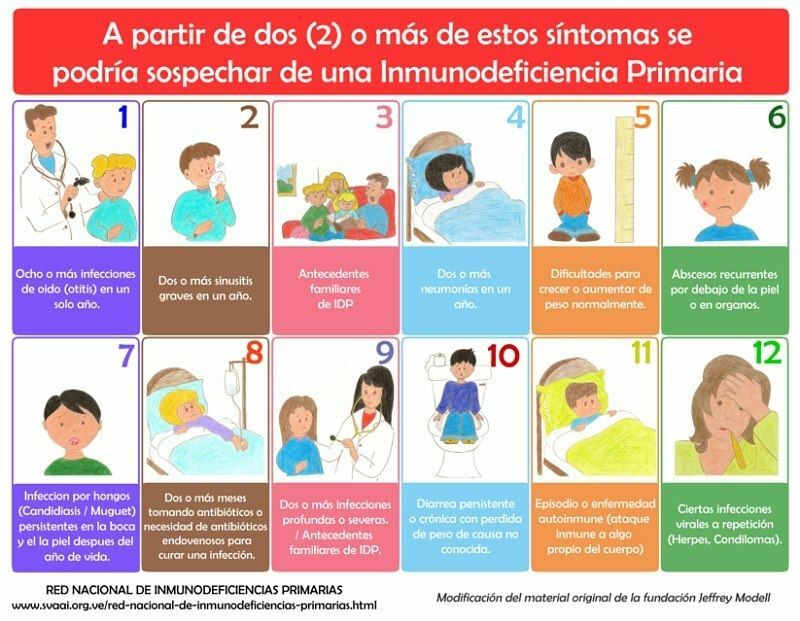 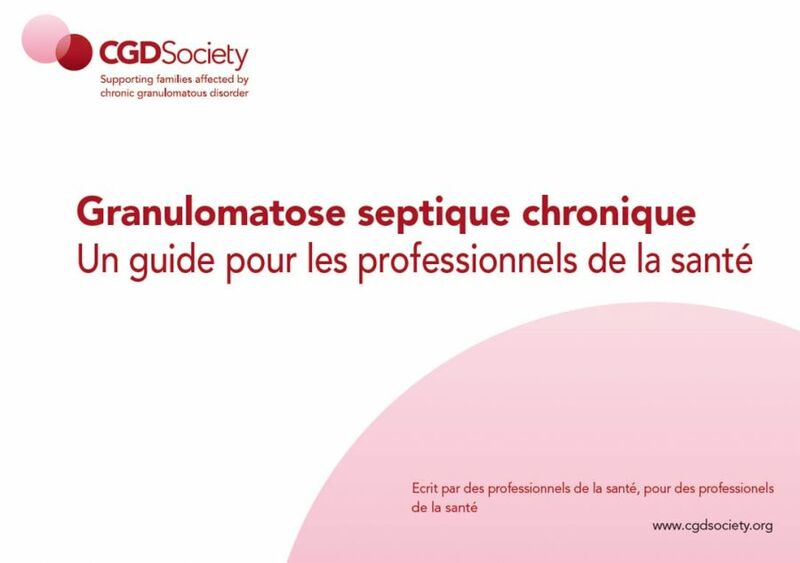 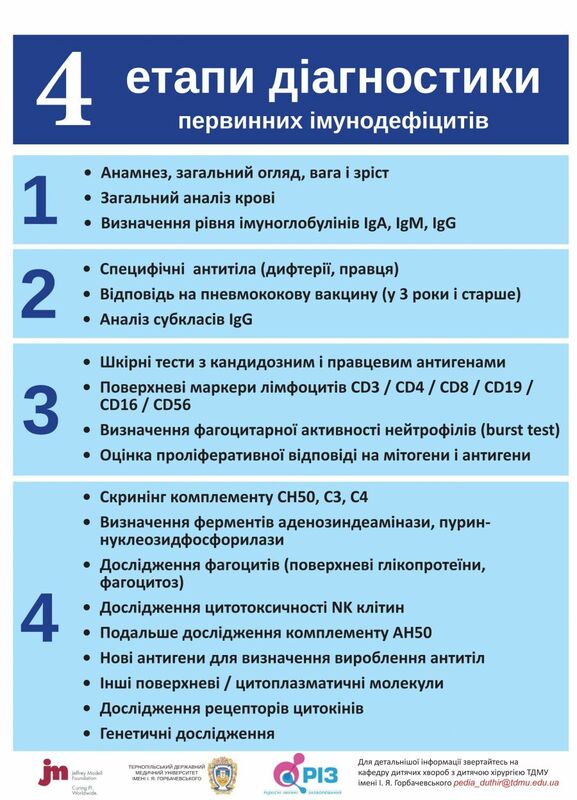 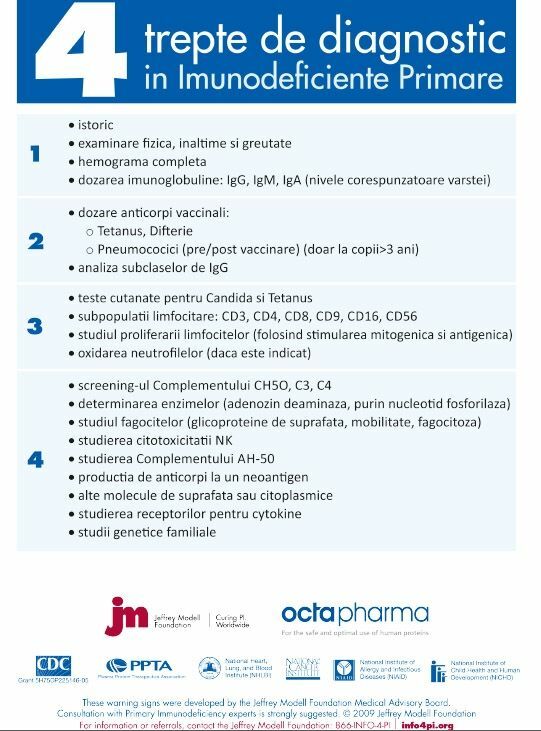 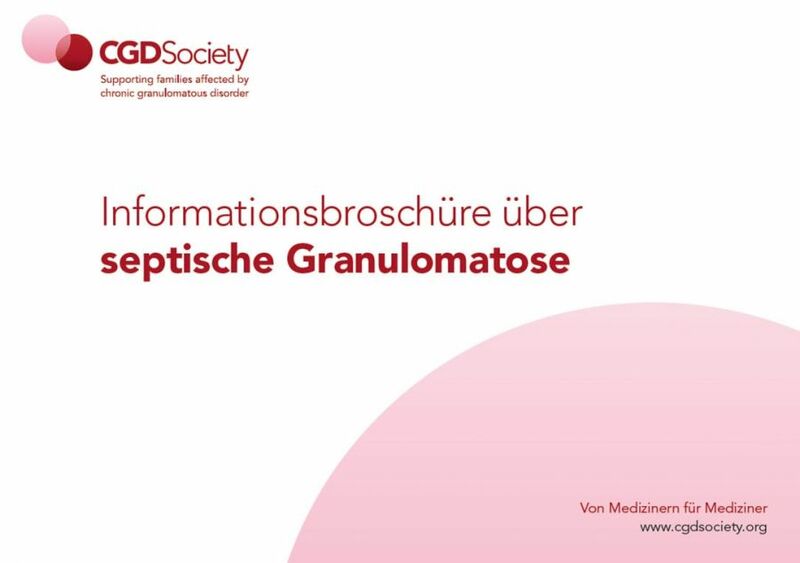 We strongly urge you to enroll your patients with T cell lymphopenia identified by SCID newborn screening in the FILL study so that there is evidence-based data to better understand, follow and manage infants with lymphopenia. 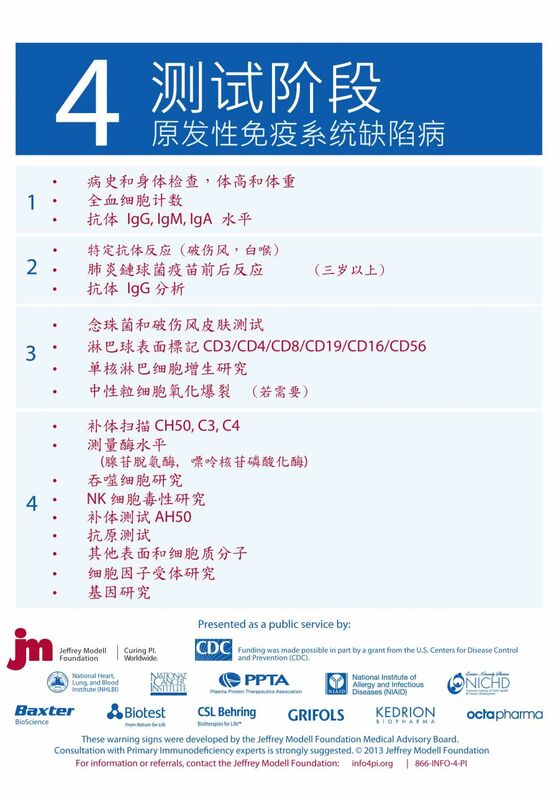 A Phase 2/3 clinical study in patients with WHIM syndrome (Warts, Hypogammaglobulinemia, Infections and Myelokathexis) with an oral CXCR4 antagonist targeting the underlying cause of WHIM is actively recruiting adult patients. 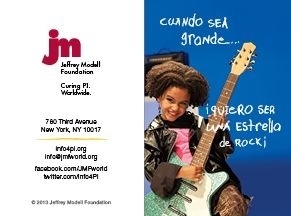 The study is being conducted at three Jeffrey Modell Foundation Centers in Seattle, Michigan and Florida. 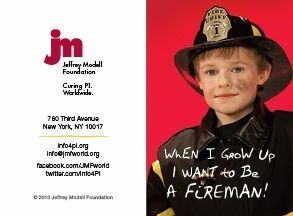 Reasonable travel, lodging and meals costs will be provided for those who are eligible and willing to participate. 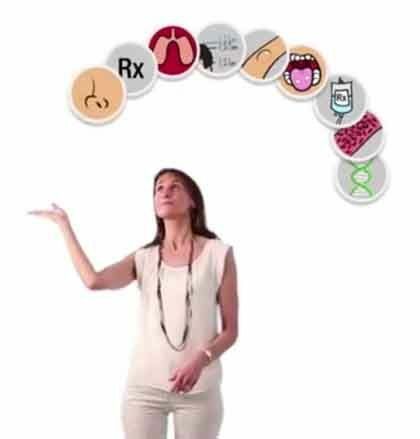 After completing the study participants may be eligible for continued access to study drug. 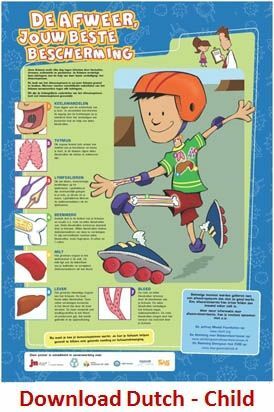 The study is registered on ClinicalTrials.gov under Identifier: NCT030005327, or by clicking here. 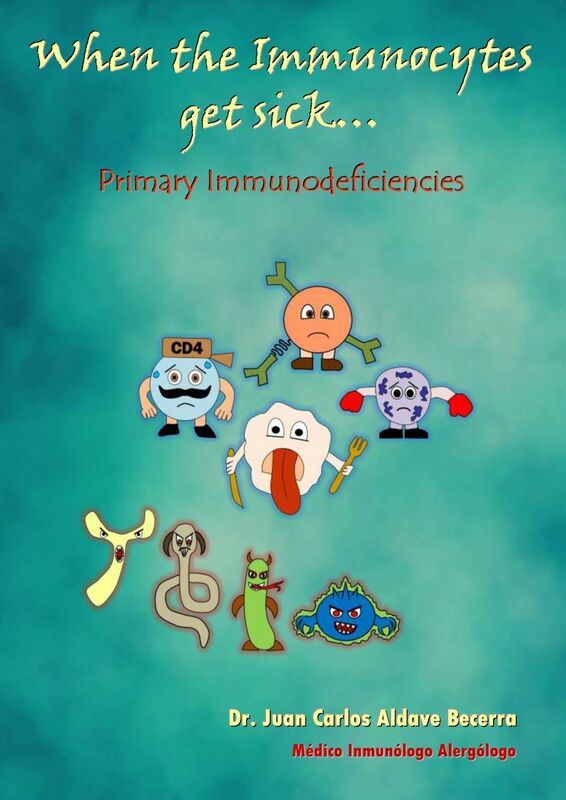 Most of these patients have chronic neutropenia and may have a PI with unknown cause. 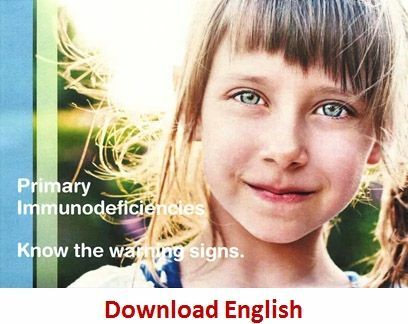 The study sponsor, X4 Pharmaceuticals, is offering free genetic testing of the CXCR4 gene for those who meet certain criteria to rule in or out WHIM. 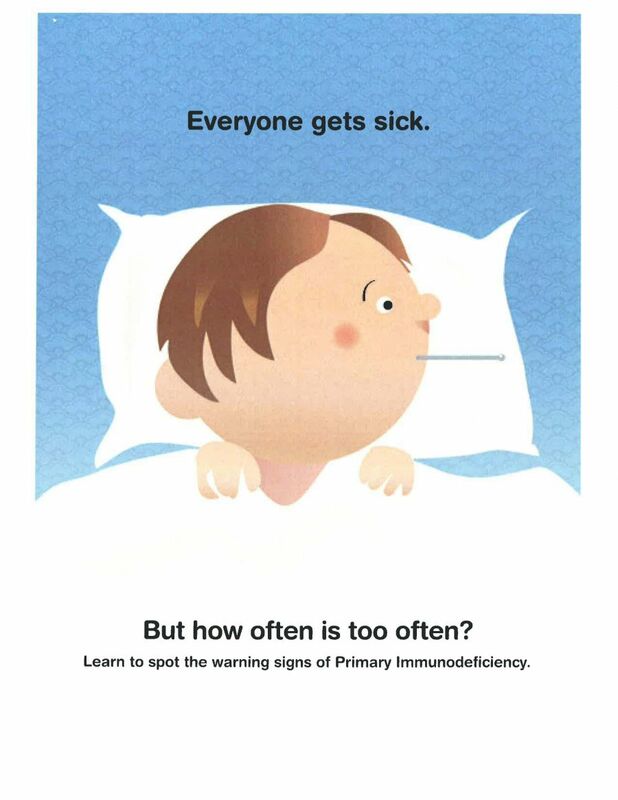 If you have patients that may be eligible for referral to the study or if you are interested in having any patients suspected to have WHIM genetically tested then please contact X4 Pharmaceuticals (patientinfo@X4pharma.com) or contact Ramsey Johnson in Clinical Operations (857-529-8308). 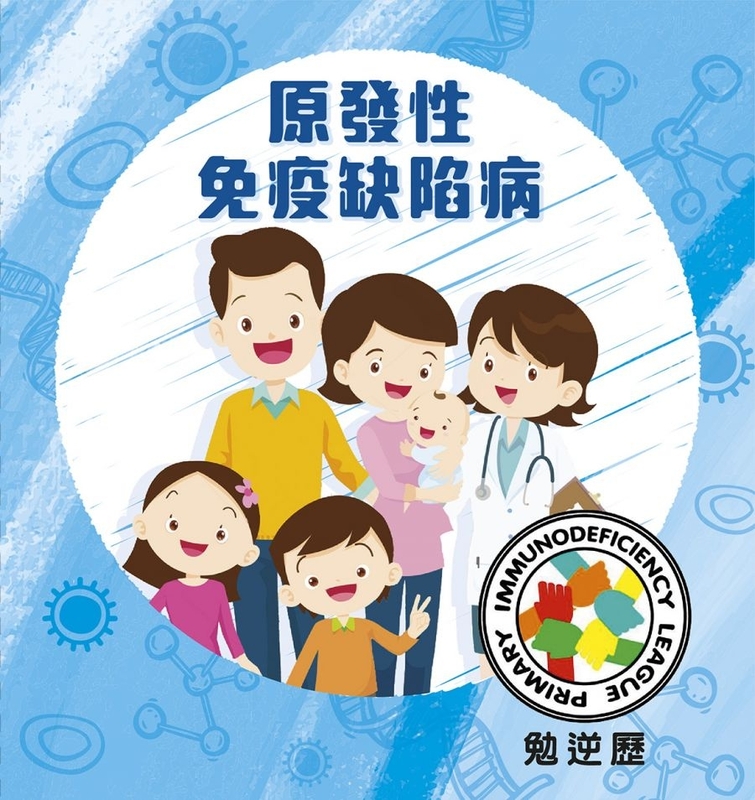 This study developed as an offshoot and direct result of newborn screening for SCID and T cell lymphopenia (NBS SCID) in the United States. 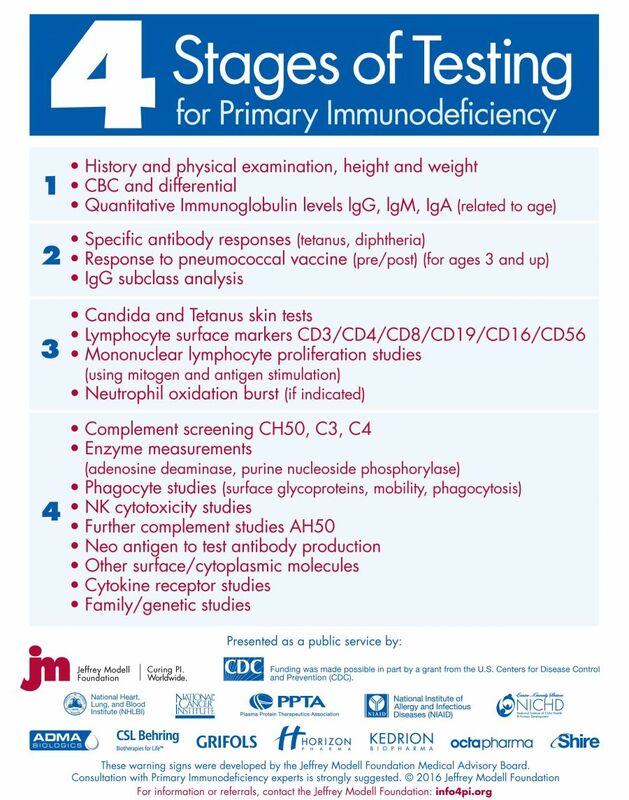 This study intends to enroll infants who are initially identified during newborn screening (abnormal TREC result on SCID screening) and confirmed by a physician to have lymphopenia. 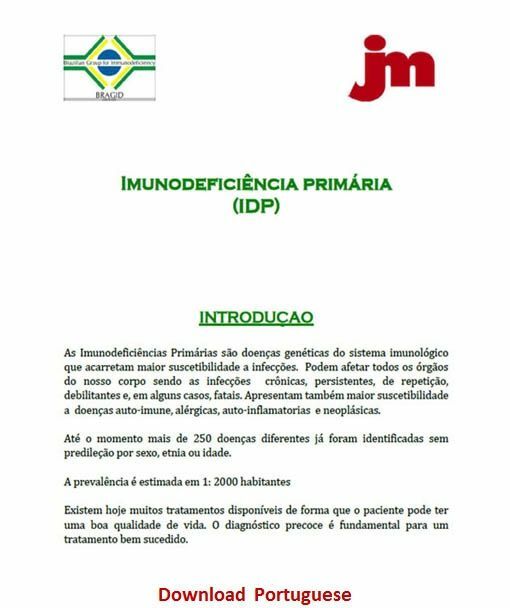 The study will collect data on 200 infants who are enrolled by April 1, 2018. 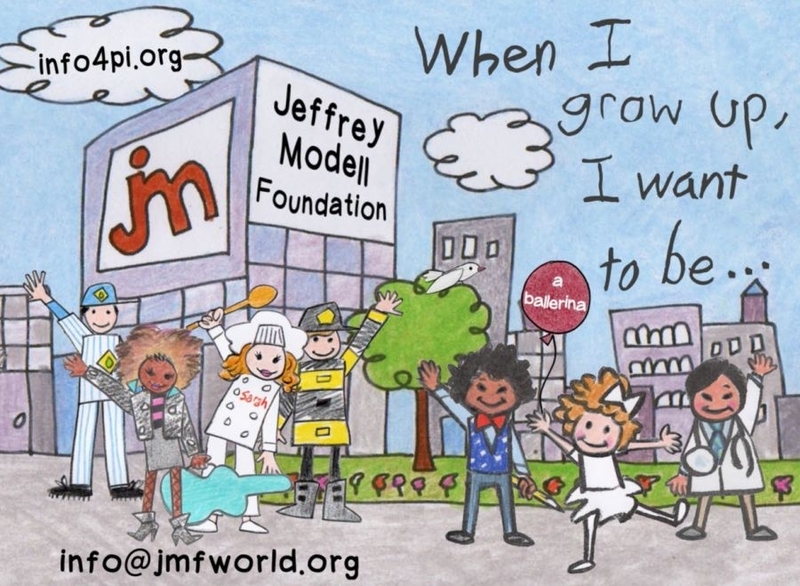 The FILL database was created and is maintained by the USIDNET, through a pilot grant provided by the Jeffrey Modell Foundation to the Clinical Immunology Society (CIS). 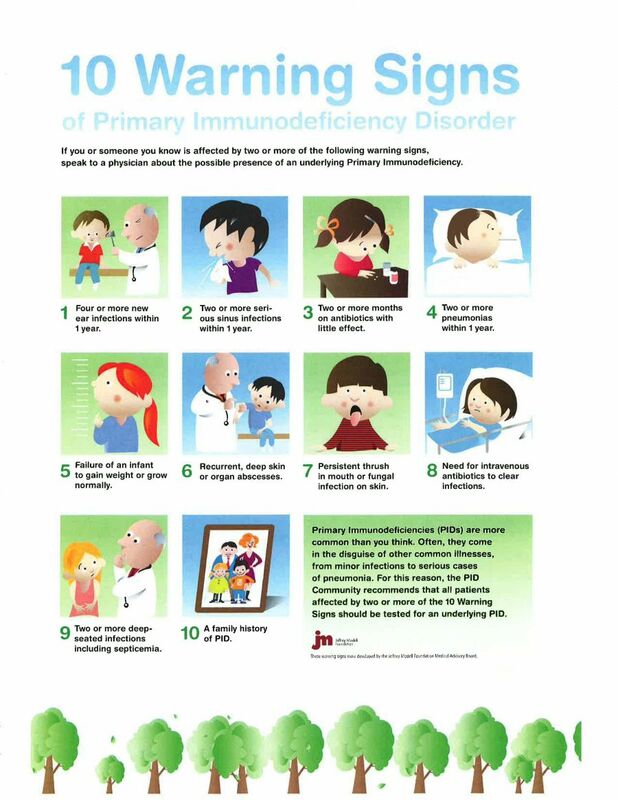 Patient data can be entered into the FILL Database either by enrollment through an USIDNET center, or through direct physician referral to USIDNET. 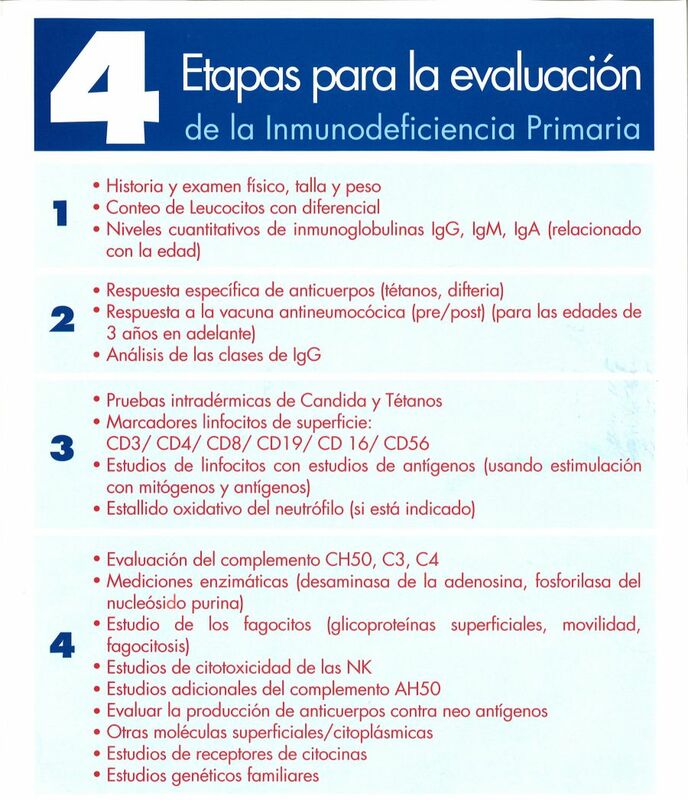 All patients enrolled in the study have to be consented through an IRB protocol.